Confirms the minutes of the meeting of the Works and Infrastructure Committee, held on 16 August 2018, as a true and correct record. Receives the report Wastewater and Stormwater/Flood Protection Asset Management Plans 2018 - 28 (R9670) and its attachments (A1611752; A1711433). Adopts the Wastewater and Stormwater/Flood Protection Asset Management Plans 2018-28 (A1611752; A1711433), amended to reflect the approved Long Term Plan 2018-2028. Receives the report Nelson Tasman Regional Landfill Business Unit Landfills Asset Management Plan (R9496) and its attachment (A1998592). Approves the Nelson Tasman Regional Landfill Business Unit Landfills Asset Management Plan (A1998592). 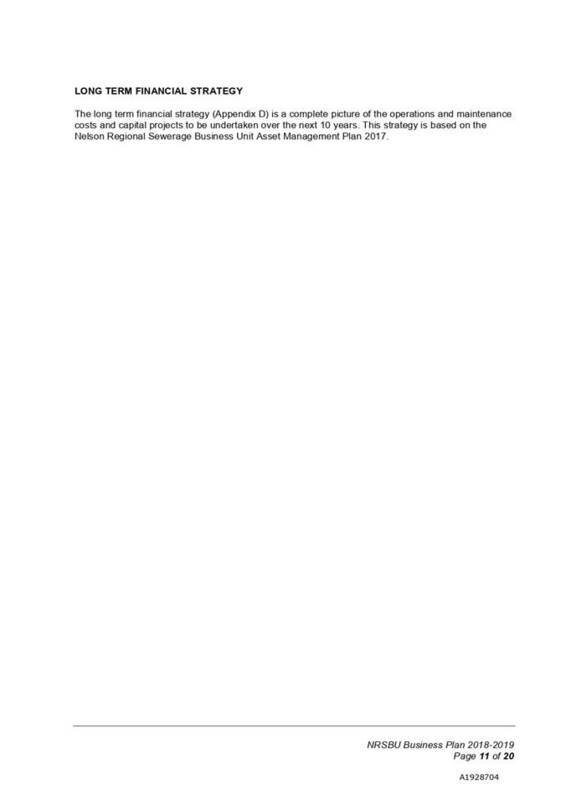 Receives the report Nelson Tasman Regional Landfill Business Unit Treasury Policy (R9441) and its attachment (A1963932). Approves the Nelson Tasman Regional Landfill Business Unit Treasury Policy (A1963932). 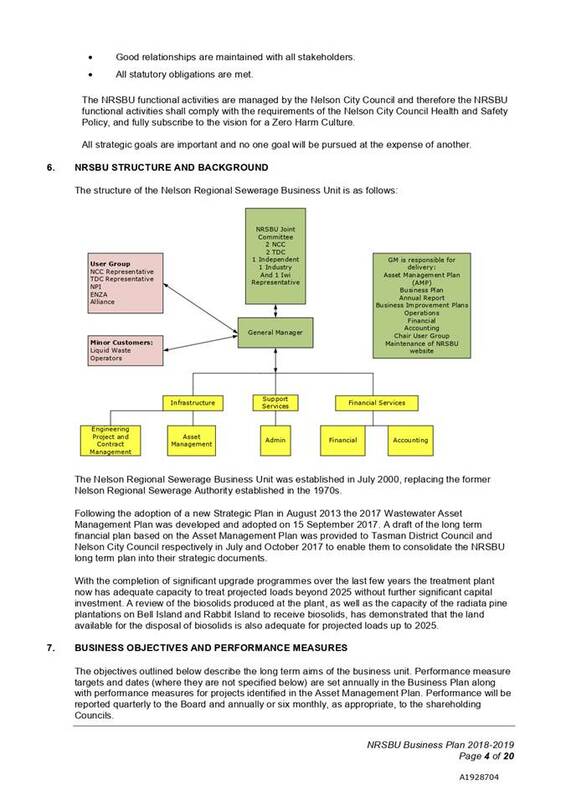 Approves feedback be given to the Nelson Regional Sewerage Business Unit through the Acting General Manager that further review of the draft NRSBU Business Plan 2018-19 is required so that it better complements Nelson City Council’s Long Term Plan and the Council’s environmental aspirations. Endorses the approach to re-direct obvious private stormwater inflows out of the sewer system and that these “quick-wins” (up to $500) be at the cost of private landowners. 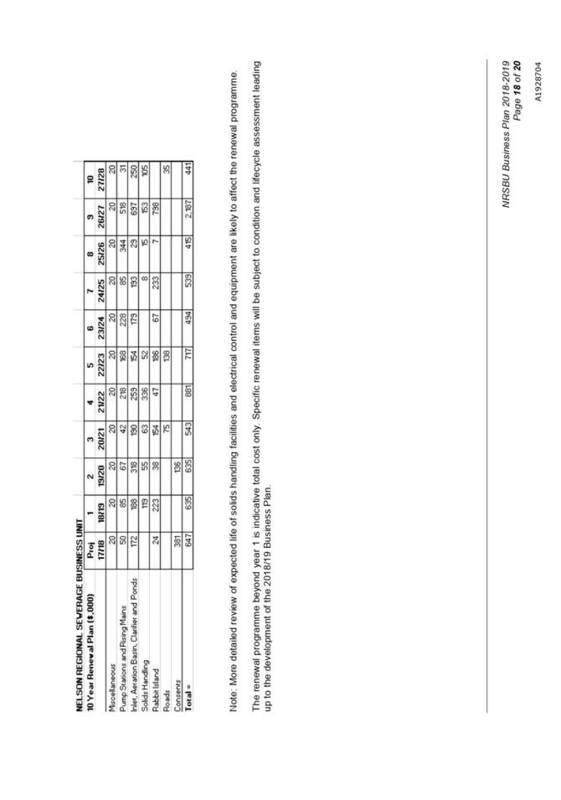 Receives the report Saltwater Creek Bridge (R9717) and its attachment A2058621. Approves an additional unbudgeted $300,000 to fund construction of the bridge in the 2018/19 financial year that will allow the award of a tender and enable work to commence this financial year. Receives the report Seafield Terrace remediation (R9621) and its attachments (A2040890, A2038309, A2041411). Approves unbudgeted expense of $50,000 in the 2018/19 financial year to commence design of the preferred option. Notes, in accordance with section 48(6) of the Local Government Official Information and Meetings Act 1987, the knowledge that Dr Tom Shand, Mark Foley and Kerry Anderson posess relates to the Seafield Terrace remediation. On Thursday 16 August 2018, commencing at 9.00a.m. Mr Bushell gave a presentation about how Community Compost Nelson had gone about developing a community composting system for food waste in Nelson. Attendance: 9.07a.m. Councillor Lawrey joined the meeting. Mr Bushell answered questions about collection charges, the sale of compost, and the hopes the organisation has for collaboration with Nelson City Council in supporting waste minimisation in Nelson. Document number M3586, agenda pages 7 - 15 refer. Confirms the minutes of the meeting of the Works and Infrastructure Committee, held on 28 June 2018, as a true and correct record. The Chairperson invited Group Manager Infrastructure, Alec Louverdis to give an update on the spillage of sulphuric acid into the stormwater system that had occurred earlier that day as a result of a traffic accident on Tahunanui Drive. Mr Louverdis noted that the incident response was going well given the circumstances, and that the estuary had not been affected at the time. The Chairperson tabled his Chairperson’s Report (attached A2031510) and summarised his update on the Modellers Pond regarding the reduction of algae occurrence. Discussion took place regarding the make up of the pond water, evaporation, ground water, tide influence, monitoring and returning the pond to the estuarine environment. The meeting was adjourned from 9.35a.m. until at 9.43a.m. Further discussion took place regarding the budget for the Modellers Pond and the Diatomix dosing trial. The Chief Executive, Pat Dougherty advised he would provide Members with further information on the budget following the meeting. Attendance: Councillor Skinner left the meeting at 9.48a.m. Document number R9056, agenda pages 16 - 18 refer. Senior Asset Engineer – Solid Waste, Johan Thiart presented the report, noting that there were no changes to the Asset Management Plan following the Long Term Plan process. Receives the report Solid Waste Asset Management Plan 2018 - 2028 (R9056) and its attachment (A1828548). Document number R9032, agenda pages 19 - 27 refer. Attendance: Councillor Skinner returned to the meeting at 9.50a.m. Senior Asset Engineer – Utilities, Phil Ruffell presented his report and answered questions about the automated meter trial undertaken in Nelson; tracking water losses; communication with contractors; potential shared use of meters with Network Tasman; and the Three Waters Review. Attendance: Councillor Matheson left the meeting from 9.56a.m. to 9.58a.m. It was noted that officers would discuss the residential water meter renewals business case with Mr Steve Cross who had offered to review it. Attendance: Councillor Acland left the meeting 10.19a.m. It was noted that where the Water Supply Asset Management Plan 2018-2028 refers to the proposed renewal of residential water meters commending ‘over a three year period from 2019/20’, the year should read ‘2018/19’. The meeting was adjourned at 10.29a.m. and reconvened at 10.49a.m. Receives the report Water Supply Asset Management Plan 2018 - 2028 and its attachments (A1620958 and A2021298). Document number R8928, agenda pages 28 - 42 refer. Manager Roading and Utilities, Marg Parfitt presented her report. Receives the report Paxster Use on Nelson Footpaths (R8928) and its attachments (A1844004, A1990509 and A1990504). Attendance: Councillor Lawrey left the meeting at 10.58am. Attendance: Councillor Acland returned to the meeting at 11.03a.m. The meeting went into public excluded session at 11.03am and resumed in public session at 11.06am. There being no further business the meeting ended at 11.06am. 1.1 To adopt the Wastewater and Stormwater/Flood Protection Asset Management Plans 2018-28 (AMP’s). Receives the report Wastewater and Stormwater/Flood Protection Asset Management Plans 2018 - 28 (R9670) and its attachments (A1611752, A1711433). Adopts the Wastewater and Stormwater/Flood Protection Asset Management Plans 2018-28 (A1611752, A1711433), amended to reflect the approved Long Term Plan 2018-2028. 4.1 The draft Wastewater and Stormwater/Flood Protection AMP’s 2018-28 adopted by Council on 21 September 2017 have been amended to reflect the LTP 2018-28 as adopted by Council on 21 June 2018 and now require Council approval as final versions. 4.2 The following paragraphs summarise relevant resolutions made at the LTP deliberations meeting that affect budgets within the AMP’s 2018-28. 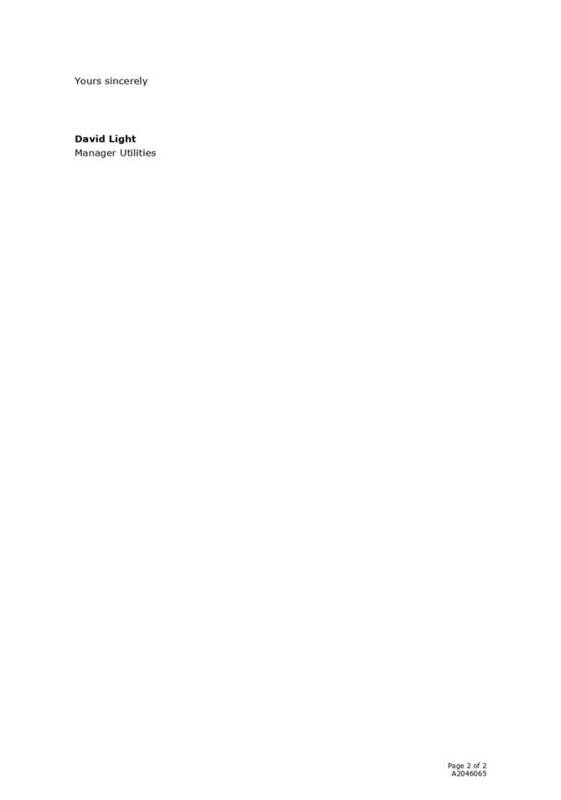 These changes have been incorporated into the final documents and highlighted for the purposes of transparency (highlights will be removed prior to publishing). 4.2.1 An additional budget of $160,000 was approved for the Saxton Creek Bridge widening in year 2019/20. 4.2.2 Funding of $150,000 was included to upgrade the wastewater network at Elm Street in 2019/20 to allow for growth in the Hill Street North catchment. 4.2.3 Funding for the extension of the wastewater network from Daelyn Drive to Hill Street North was delayed by one year to 2019/20. 4.4 Planning for the Activity Management Plans 2021-31 is underway. To ensure officers have a clear understanding of Council’s expectations and key issues a number of workshops will be arranged with the Works and Infrastructure Committee over the next three years. 5.1 The Wastewater and Stormwater/Flood Protection AMP’s 2018-28 support Council in meeting its obligations under section 93 and Schedule 10 of the Local Government Act 2002 (LGA) and the recommended option is for Council to adopt these plans. · Support Council to meet requirements of the LGA. 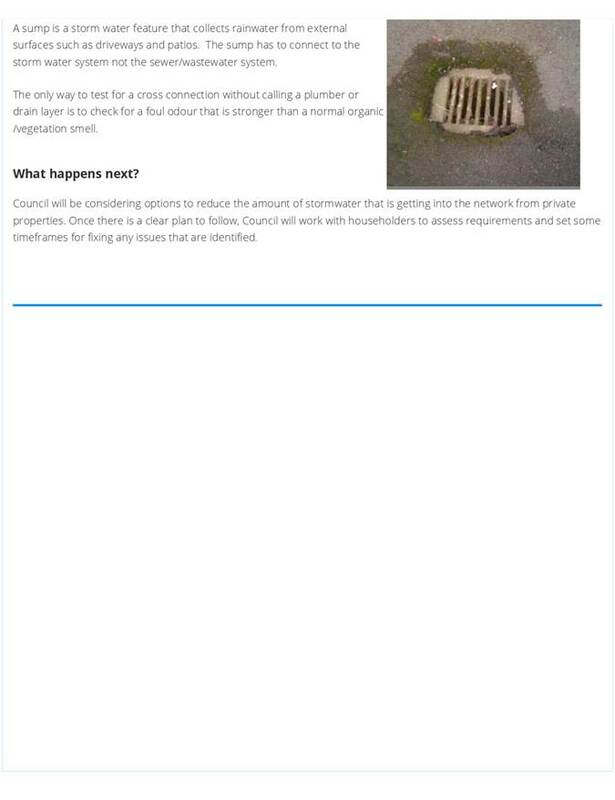 · Not adopting the AMP’s would leave Council without a clear plan to mitigate risks and achieve levels of service. 6.1 The Wastewater and Stormwater/Flood Protection AMP’s 2018-28 have been reviewed and amended to reflect all decisions made by the Council in the adopted LTP 2018-28. The Wastewater and Stormwater/Flood Protection AMP’s 2018-28 set out how Council will deliver agreed levels of service to the community in the most cost effective way. Adopting the Wastewater and Stormwater/Flood Protection AMP’s 2018-28 is a low risk as they have been through a thorough development process and reflects all of the relevant LTP decisions. Adopting the AMPs also helps Council mitigate risks by providing a clear plan to achieve levels of service, address relevant focus areas and set activity budgets for operations, maintenance, renewals and capital expenditure. The Wastewater and Stormwater/Flood Protection AMP’s reflect the decisions made by Council on the 21 June 2018 when the LTP 2018-28 was adopted and sets out budgets for both operational and capital expenditure. Funding is both directly from rates and indirectly through borrowing. This matter is of low significance because decisions arising from the Wastewater and Stormwater/Flood Protection AMP’s 2018-28 which were considered to be significant were consulted on through the LTP. No consultation with Māori was undertaken with respect to this report. 1.1 To receive and approve the Nelson Tasman Regional Landfill Business Unit (NTRLBU) Landfills Asset Management Plan (AMP). 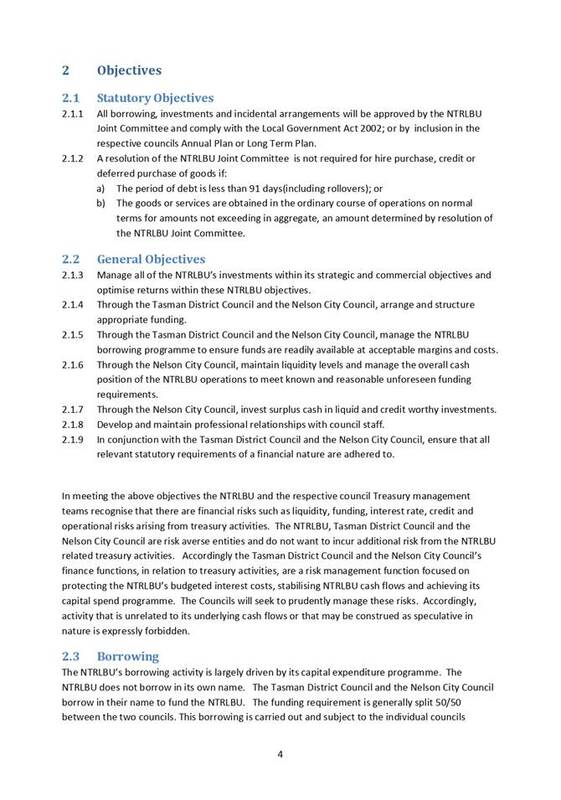 3.1 The NTRLBU was established by Nelson City Council (NCC) and Tasman District Council (TDC) to manage and operate regional landfill facilities and the Terms of Reference require the NTRLBU AMP to be submitted to the two Councils for approval. 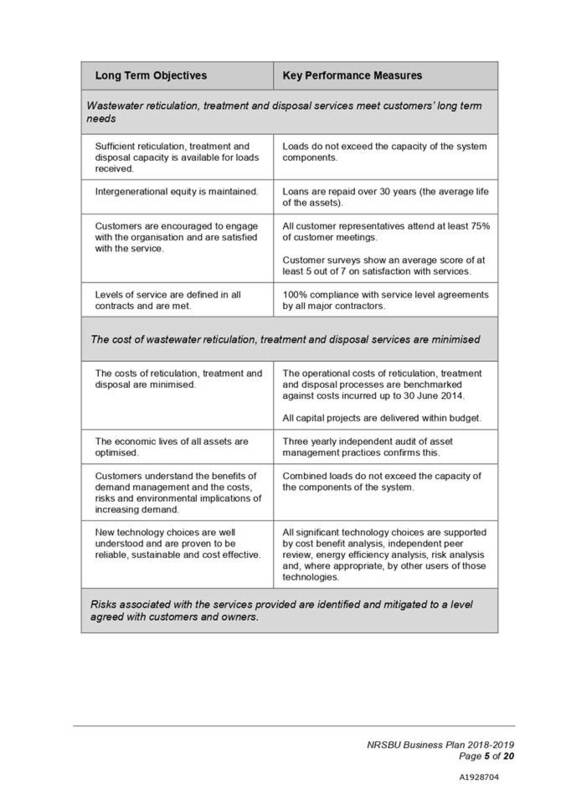 4.1 The AMP provides analysis of the assets and services delivered by the NTRLBU to its customers, future demand, financial analysis of the NTRLBU operations and outlines how risk is managed. This AMP was developed within the context of the current Nelson Tasman Joint Waste Management and Minimisation Plan, April 2012 (JWMMP). 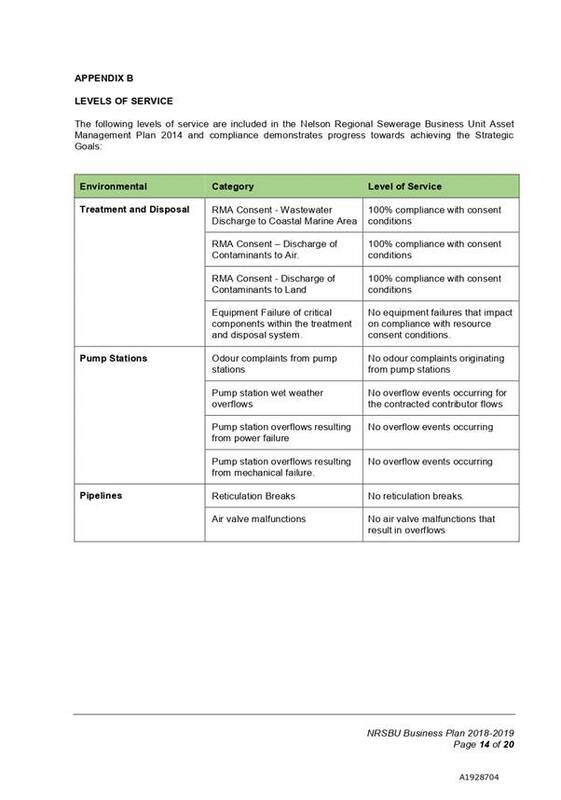 4.3 The AMP identifies the procurement of a new operations contract, longer term impact of the Emissions Trading Scheme compliance costs and the development of the landfill airspace following closure of the current landfill area at York Valley in around 14 years as issues that need to be considered in more detail. 4.4 These issues as well as issues relating to the emerging consensus across New Zealand society that the waste levy should be increased to generate funding for intervention by government to stimulate and direct the circular economy to achieve improved waste management outcomes, will need to be considered during annual AMP reviews. 4.5 The Draft JWMMP, approved by both Councils, is due to go out for consultation on 17 August 2018 and whilst similar to the existing JWMMP, it is possible that the hearing panel could decide that the new JWMMP needs to set specific targets for the region. 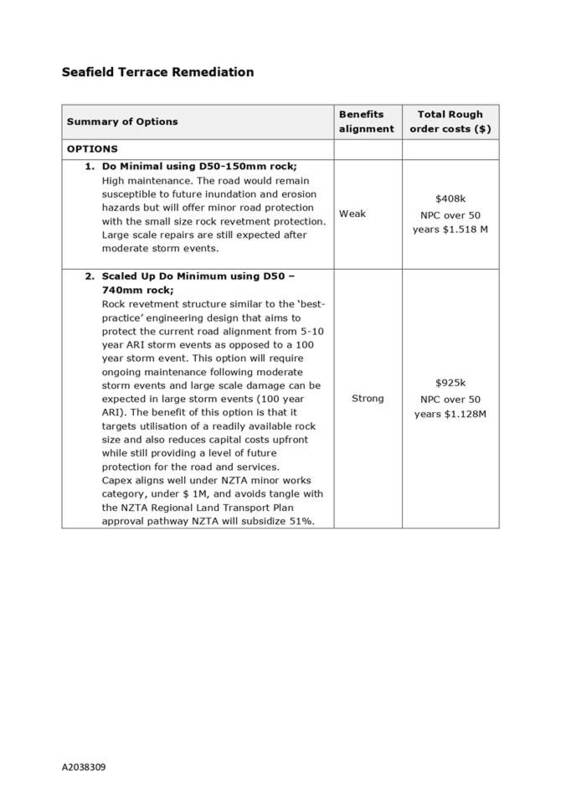 If that is the case the AMP may need to be amended so that the implications of the targets set in the new JWMMP are considered and reflected in future Annual and Long Term Plans. · Give effect to the Deed of Agreement and demonstrates support for the joint committee. 6.1 The AMP has been approved by the NTRLBU to be forwarded to the two Councils for approval. The decision to accept this AMP is consistent with the Deed of Agreement for establishment of the NTRLBU and is not considered to be inconsistent with any decisions of Council. There are no direct funding implications for NCC from the recommendation. Programmes and projects that will be implemented through the plan will be funded by the users of landfill services. This matter is of low significance because the AMP is consistent with the Business Plan approved by the two Councils and used to inform their respective 2018/2028 LTP’s. · Solid waste including landfill and transfer stations. 1.1 To receive and approve the Nelson Tasman Regional Landfill Business Unit (NTRLBU) Treasury Policy (Policy). 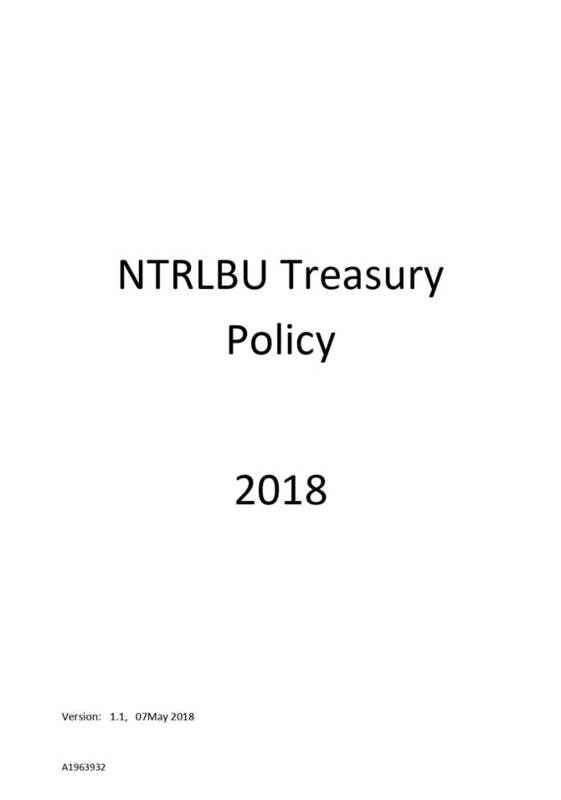 4.1 Having recently been formed the NTRLBU does not have a formal treasury policy. A Policy was developed with input from the Tasman District Council Corporate Services Manager, Nelson City Council Group Manager Corporate Services and PWC (both Councils’ Treasury Adviser). 4.2 The Policy is based on the Nelson Regional Sewerage Business Unit Treasury Policy and provides for the settling of interest in the facilities on an equal and verifiable basis. 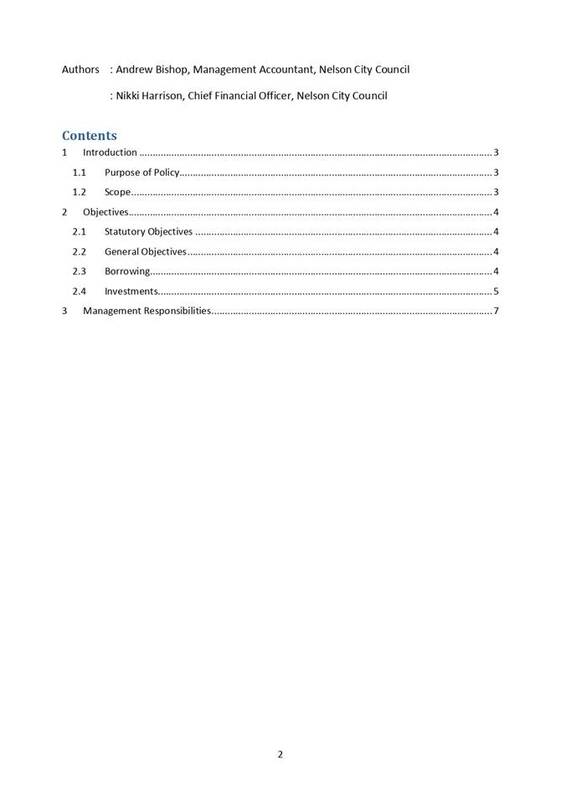 4.3 While the NTRLBU Terms of Reference that accompany the Deed of Agreement do not reference a treasury policy nor that it needs to be approved by the two Councils, the NTRLBU resolved, for consistency with the way in which both business units operate, to submit the Policy to the two Councils for approval. 4.4 There are two options – Either approve or not approve the draft Policy. Officers’ preferred option is for Council to approve the Policy. · Ensure that the approach for NTRLBU and NRSBU is consistent. · It is considered best practice to adopt a treasury policy. · Inconsistent with the NRSBU approach. · Inconsistent with best practice. 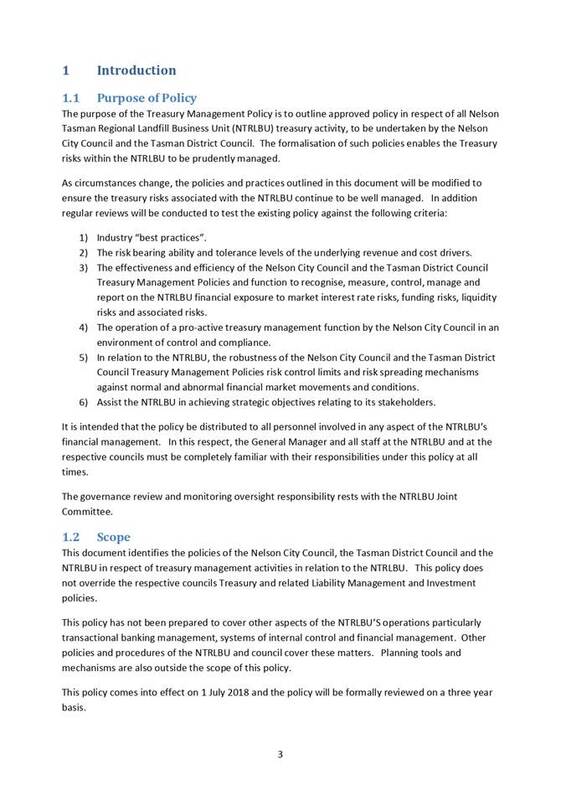 5.1 A draft NTRLBU Treasury Policy has been developed by both Councils for the NTRLBU and is submitted for approval by the two Councils. The Policy supports Council in meeting its obligations under Local Government Act 2002. Any decision to accept this Policy is consistent with the Deed of Agreement for the NTRLBU and is not considered to be inconsistent with any decisions of Council. 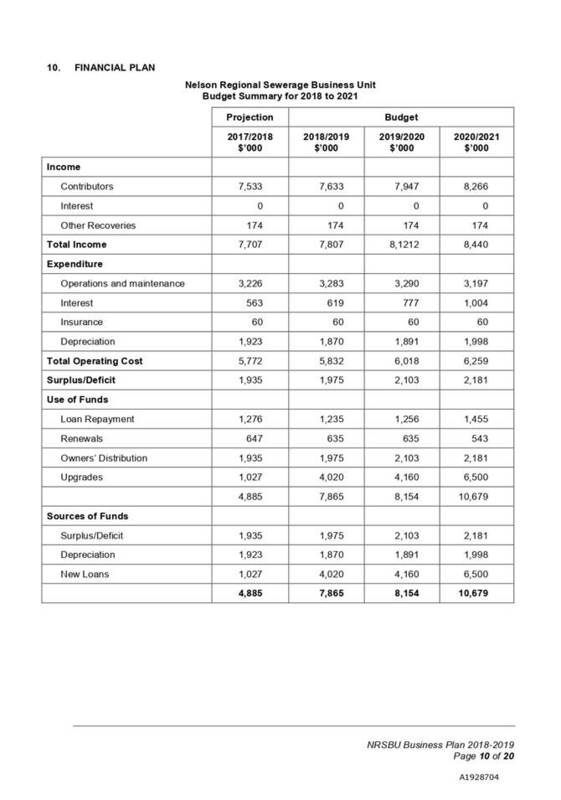 The risk of not having a Treasury Policy is that this is inconsistent with the other joint Councils Business Unit (NRSBU) and it is not best practice. There are no direct funding implications for either Council from having a Treasury Policy. The NTRLBU Treasury Policy formalises the existing relationship between the Committee and both Councils relating to treasury functions. 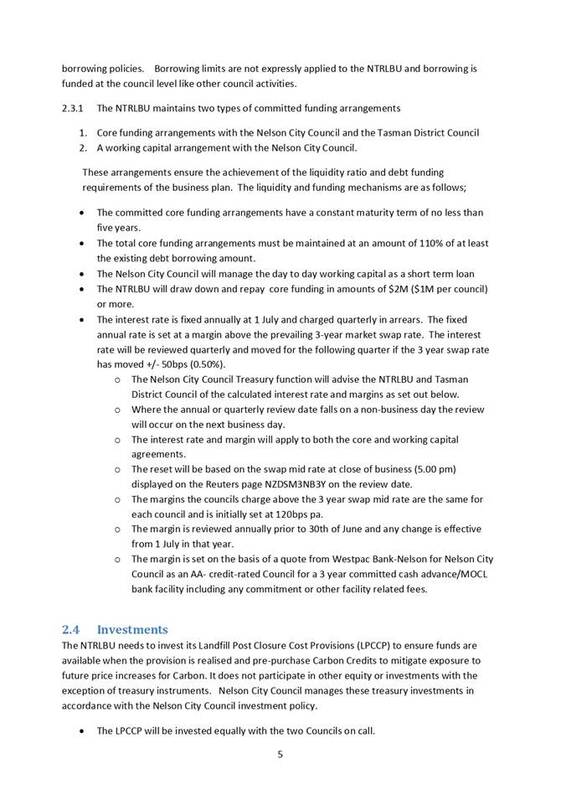 1.1 To approve feedback to the Nelson Regional Sewerage Business Unit (NRSBU) through the Acting General Manager on changes the Nelson City Council (NCC) requires to the draft 2018/19 Business Plan (Plan) that reflects/complements Nelson’s Long Term Plan (LTP) and the Council’s environmental aspirations. 3.1 The NRSBU was established by the Nelson City Council (NCC) and Tasman District Council (TDC) in July 2000. 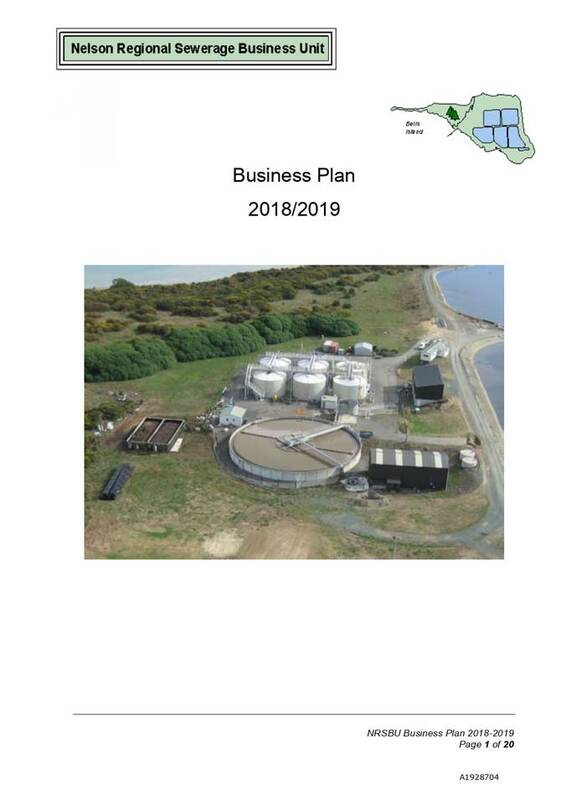 Its purpose is to manage and operate the wastewater treatment facility at Bell Island and the associated reticulation network efficiently and in accordance with resource consent conditions and to meet the needs of its customers. The business plan should state the activities and intentions of the Business Unit. It should outline how those activities relate to the objectives of the Business Unit as documented in the current strategic plan, the financial forecasts for the following three years, the performance targets for the coming year and any variations to charges proposed for that financial year. 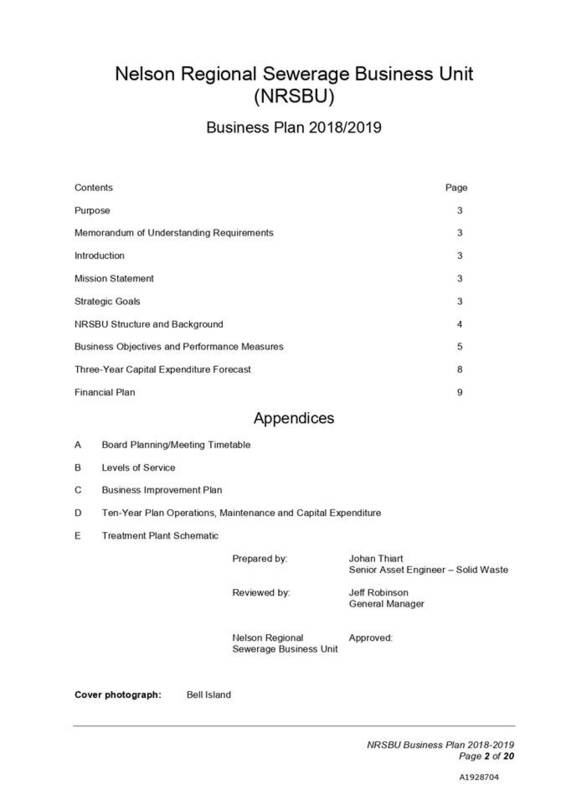 A draft of the business plan for the coming year shall be presented to the Councils annually by 31 December. 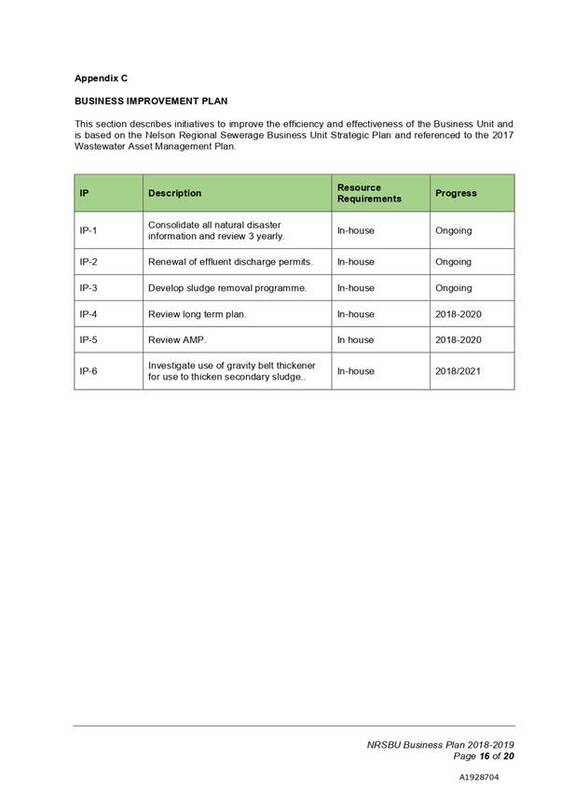 3.3 A report was presented to the Works and Infrastructure Committee in March 2018 to receive the NRSBU Draft Plan (refer to Attachment 1). The Business Plan has been approved by TDC. 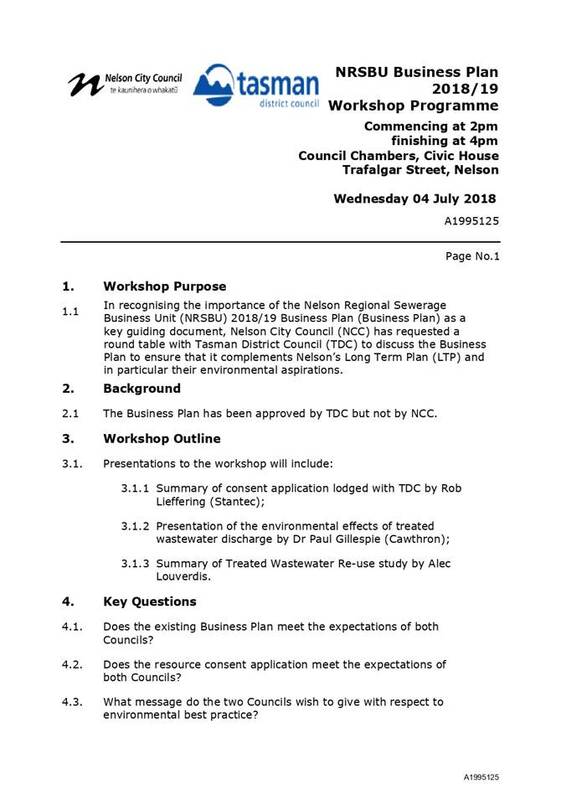 “Leaves the item Nelson Regional Sewerage Business Unit Draft Business Plan 2018/19 to lie on the table until a Joint Nelson City Council and Tasman District Council workshop is held to review the strategic direction and a further report be brought to a Works and Infrastructure meeting”. 3.5 On 4 July 2018 a joint NCC/TDC workshop was held. Key questions were posed as outlined in the workshop programme (refer to Attachment 2). The workshop failed to find common ground. 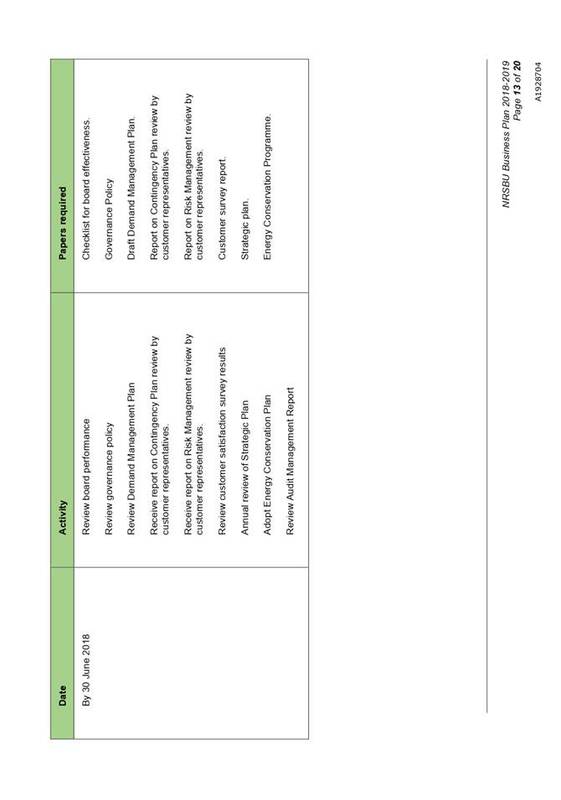 4.1 The draft Plan is consistent with the financial programmes used to develop the current LTP’s of the two Councils. It is however light on detail in terms of how the Plan will contribute to NCC’s LTP goal of improved environmental outcomes, particularly around reduced discharge into the Waimea Estuary and increased re-use of treated wastewater. 4.2 In order to move this issue forward officers propose that the Works and Infrastructure Committee advise the NRSBU (through the Acting General Manager) that further work is required to the Plan, in particular the requirement that the Plan address Nelson’s environmental aspirations of reduced discharge into the Waimea Estuary and increased re-use of treated wastewater, with the request that this be brought back to a future Works and Infrastructure Committee. 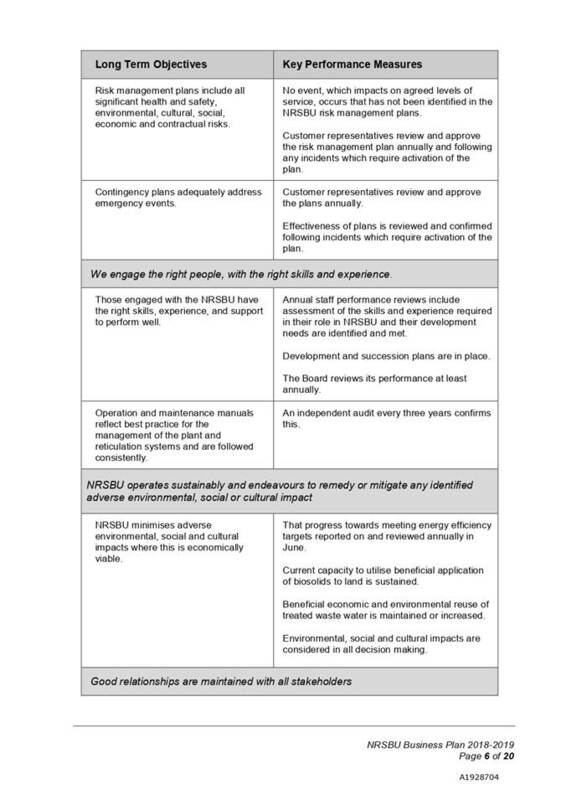 4.3 Feedback to the Acting General Manager needs to reflect clear articulated environmental outcomes and a timeframe for achievement. Policy 23 of the New Zealand Coastal Policy Statement sets the clear expectation that the discharge of treated wastewater is permitted only where specific processes are met. 4.4 The Council is also developing a programme of work to respond to national and regional initiatives in the coastal and marine areas through the Sustainable Seas National Science Challenge. · the need to give regard to the importance that water quality, biodiversity and estuary health are priorities over the next three years for Tasman Bay. 4.6 Any change to the Plan would need to be presented to the TDC. · Delay in finalising the Business Plan. 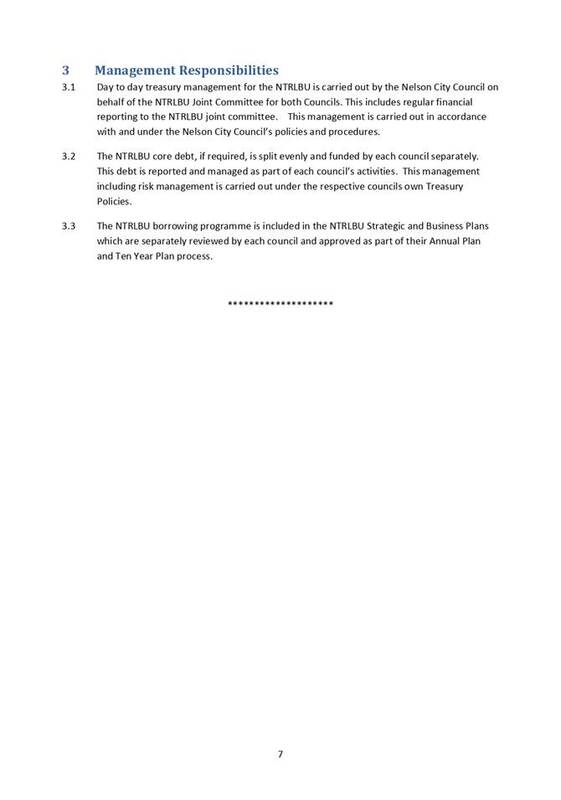 · Currently TDC have received the Plan and NCC has not. · Current plan does not reflect and complement NCC’s LTP, in particularly its high environmental aspirations. · Not the preference of the NCC. · Provides opportunity for the Plan to better reflect and complement Council’s LTP, in particularly its high environmental aspirations. · TDC may not approve any subsequent changes. · NRSBU will need to resubmit any revised plan to the TDC for approval. 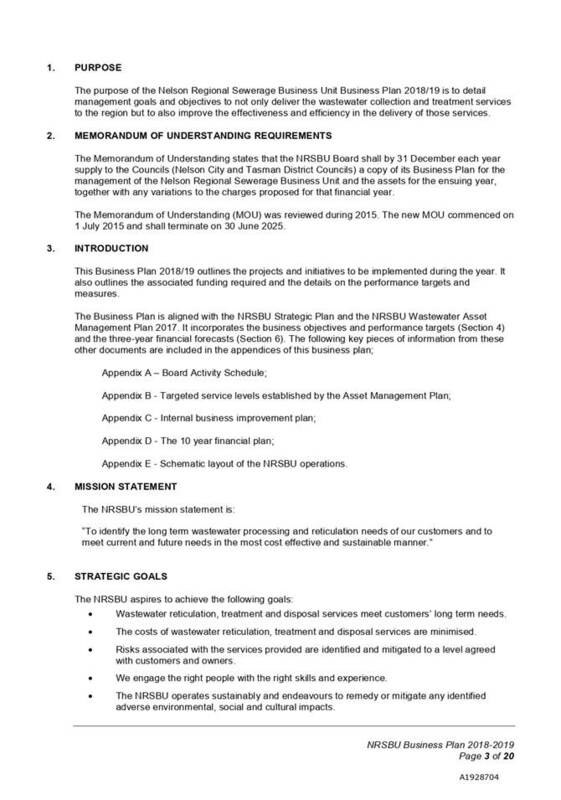 6.1 The MoU requires that a draft Plan for the coming financial year be presented to both Councils annually for comment before the final Business Plan is presented to the Council’s. The draft Plan has been approved by TDC. It was first considered by NCC in March this year, but left to lie on the table pending a joint workshop. 6.2 A workshop involving NCC and TDC councillors to consider better alignment with NCC’s LTP was held but failed to find common ground. 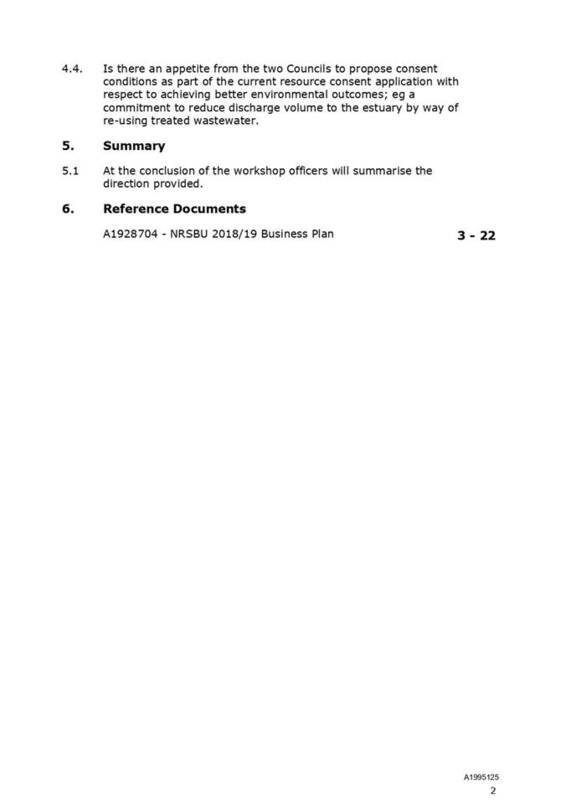 6.3 In order to move this matter forward, officers recommend that the draft Plan be sent back to the NRSBU for review with a request that it be resubmitted back to Council for presentation to a future Works and Infrastructure before been presented to Council. The decision in this report will assist in the provision of good quality environmental services in a cost effective way. The decision to request further works on the NRSBU Business Plan supports the community outcome “Our Unique natural environment is healthy and protected”. This report allows Council to comment on the NRSBU Business Plan and these comments will be considered by the Joint Committee. The risk of not providing feedback to the NRSBU will delay its ability to approve and implement actions in the Business Plan. 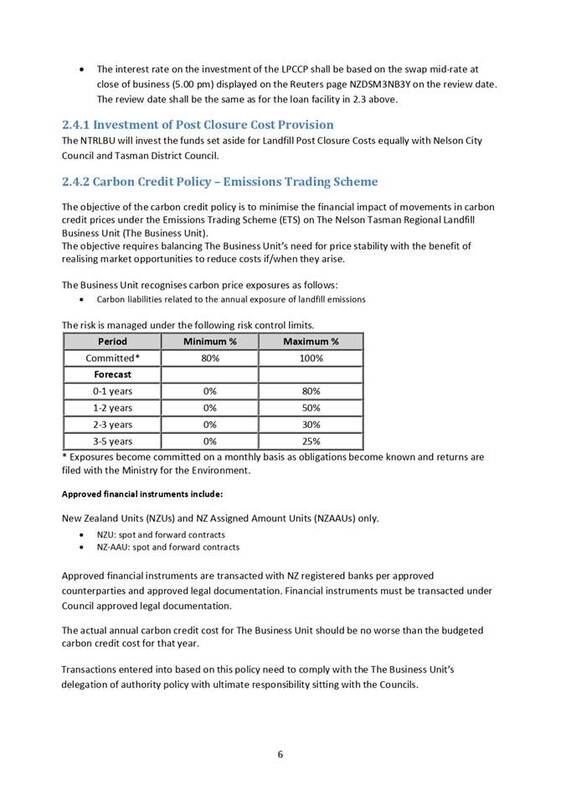 Any review of the NRSBU Business Plan to include specific environmental outcomes could have an impact on the NRSBU Asset Management Plan and subsequent Council LTP’s. The NRSBU is a Joint Committee of the two Councils and its activities are included in the Long Term Plans and Annual Plans of each Council. Consultation is undertaken by both Councils in the preparation and adoption of these plans. There has been no communication with Iwi in this regard. The Iwi representative on the Joint Committee resigned from the committee prior to the consideration of the Business Plan and has not yet been replaced. 1.1 To agree on the appropriate way to address stormwater inflow from private properties into the Council wastewater network with a priority given to a public communications plan and addressing direct inflow where “quick fixes” (up to $500) are identified. 2.1 Reducing the inflow and infiltration of stormwater into the wastewater network is a priority for Council for the next ten years and addresses two of the top four priorities of the Long Term Plan 2018-28 (LTP), namely Infrastructure and Environment. 2.2 Overflows during high rainfall events from the wastewater network discharge diluted wastewater onto streets, property, rivers/streams, the Haven and Tasman Bay. This can lead to environmental, cultural and health issues. It also impacts on development and growth in the city by making the existing situation worse. 2.3 In order to reduce the number and quantity of wet weather overflows from the wastewater network the level of direct stormwater inflow and diffuse infiltration into the network must be reduced. 2.4 A review of wastewater flows to Council’s pump stations shows a clear ‘spike’ of flow very soon after rainfall begins. This spike stops soon after the rain stops and is a result of direct inflow of stormwater into the wastewater network from downpipes and surface flows (usually through gully traps). 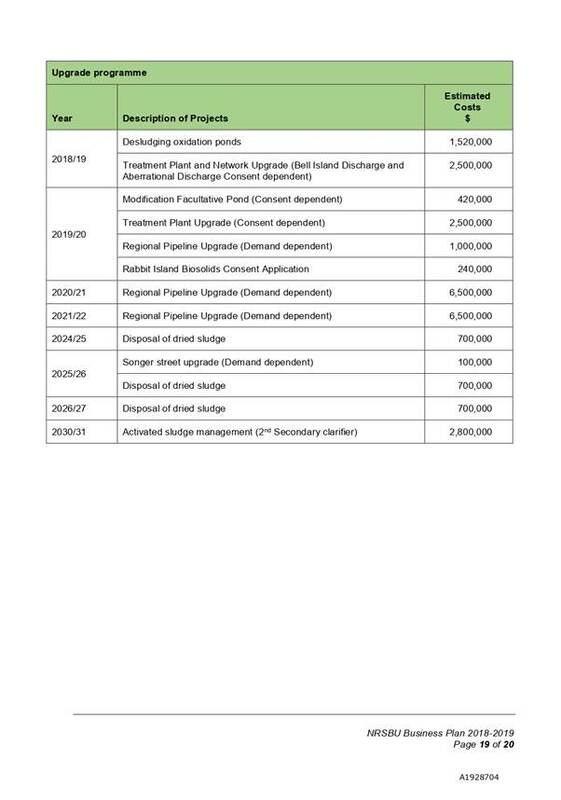 Addressing these direct inflows will provide Council with the greatest impact on addressing wastewater overflows. 2.5 Currently Council is carrying out an investigation of all properties connected to the public network. Results of visual inspections and dye testing are being collected and analysed. 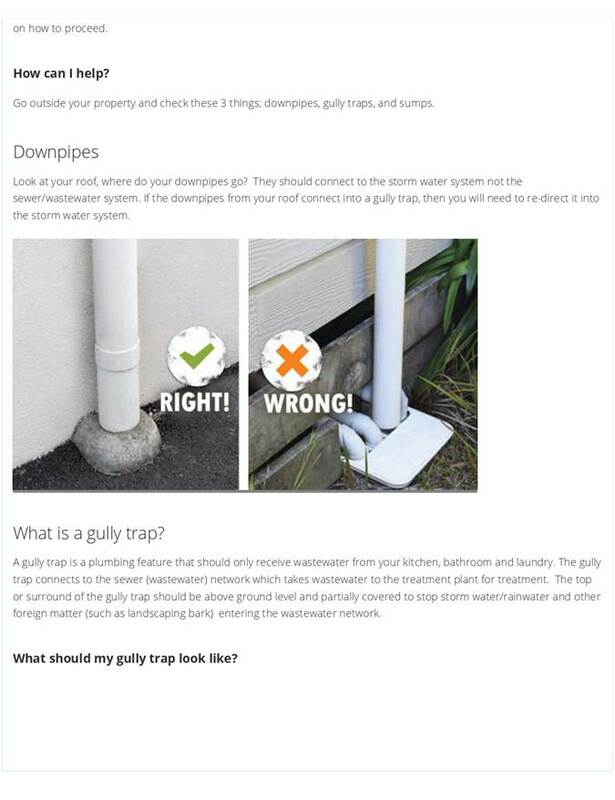 Where downpipes are discharging directly to gully traps, owners will be advised and requested to remedy the issue urgently. The likely costs of remedial works will vary from several hundred dollars to potentially thousands for the more complex fixes. 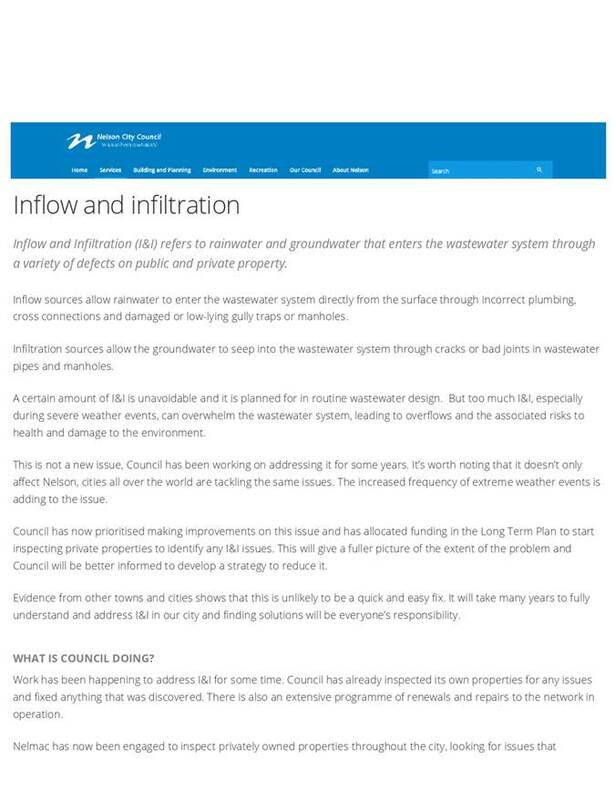 2.6 This report highlights the immediate work that needs to commence, specifically the public communications campaign essential for Council to gain traction on addressing inflow from private properties into the wastewater reticulation network. This work alone should have a positive impact on reducing wastewater overflows. This report also covers the approach to require all private owners to address obvious urgent issues that can be undertaken at relatively low cost (around $500 or less), including raising gully traps. 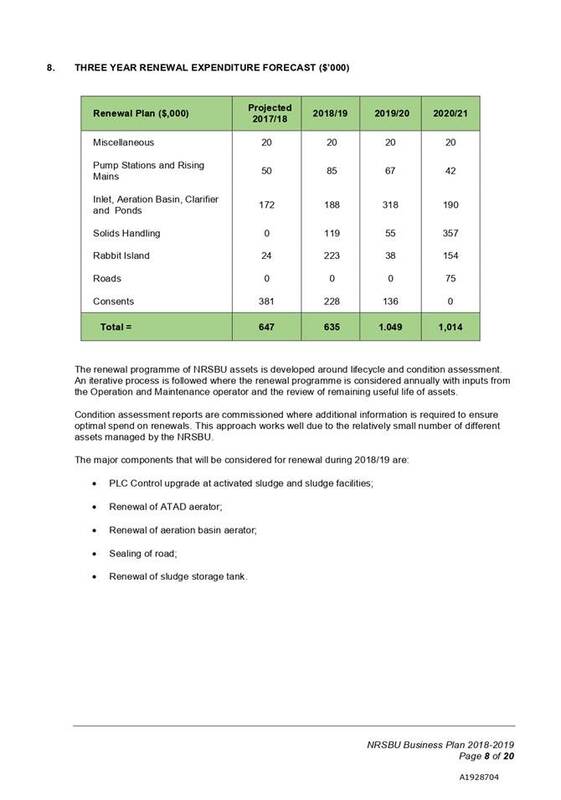 2.7 It is expected that these “quick fixes” remedial interventions identified during the first round of inspections will have a significant impact on the reduction of overflows and this success will be reported back to Council. 2.8 In tandem with this work across the entire Nelson area, a targeted trial is underway in the Rutherford area (following a submission to Council’s LTP) that will allow officers to better and more accurately identify the range of issues, possible remedial options and the quantum of costs for the large more complex fixes. This trial is expected to take 6-8 months and will guide the discussion with Council as to who undertakes these remedial works and who will cover the costs. A report will be presented to a future Works and Infrastructure Committee on the findings and options. 4.1 Stormwater inflow and infiltration into the wastewater network leads to overflows of diluted wastewater in heavy rain events. These overflows occur on both public and private property. 4.2 Monitoring wet weather flows into Councils wastewater pump stations shows strong peaks of flow soon after rainfall begins. These peaks are the result of direct inflow of stormwater from building roof areas and hard surfaces into the wastewater network. When rainfall stops these peaks drop off and overflows from manholes in the network cease. 4.3 Through the LTP, Council approved a multi-year project to investigate and reduce the levels of wastewater overflows across the city. 4.4 At a workshop on 24 July 2018 Council was briefed on the progress made to date with property investigations, looked at examples of specific property issues, and discussed in broad terms options available to Council for addressing issues on private property and the merits of making some form of expert resource available to respond to queries from property owners. 4.5 A target of up to 40% reduction in number and volume of overflows over the next ten years was also suggested as appropriate at this early stage in the project. This figure has been taken from the Water NZ Inflow and Infiltration Control Manual as the reduction in peak wet weather flow that can be expected to result from removing all inflow defects plus sealing public sewers. Monitoring of the effectiveness of the inflow reduction programme is a key component to the programme and can be used to adjust the target reduction figure on an annual basis if necessary. 5.1 In order to meet the target of a 40% reduction in number and volume of overflows over the next ten years addressing the inflow issue on public and private property is seen as a priority. 5.3 The NCC Wastewater Bylaw No 224 does not permit the discharge of stormwater to the wastewater network without specific approval. 5.4 Urgent issues in the public wastewater network that restrict flow will be remedied as they are found and non-urgent issues will be addressed as part of Council’s future annual renewal programme. 5.5 Non-urgent issues target manholes across the network in both public and private property. While the volumes of water entering the network through manholes are likely to be smaller than those coming from roof and other areas on private property the large number of manholes could lead to a significant volume of water in total. However it is unlikely that this work alone will deliver the full reduction in overflow numbers and volume required. 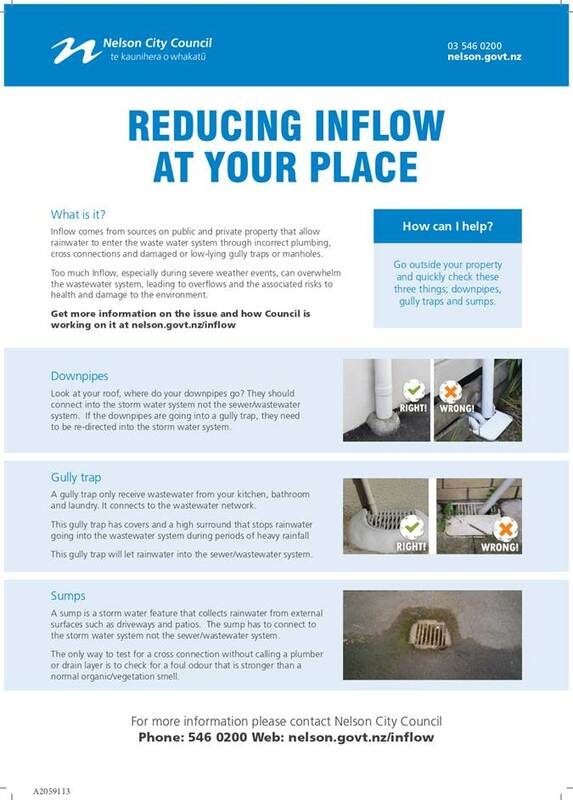 5.6 The visual investigation programme currently being undertaken by Council’s contractors is designed to identify issues such as a downpipe discharging into a sewer gully trap or inadequate gully trap construction. Works to date show that approximately 25% of properties inspected have some of these issues that can lead to inflow into the wastewater network. 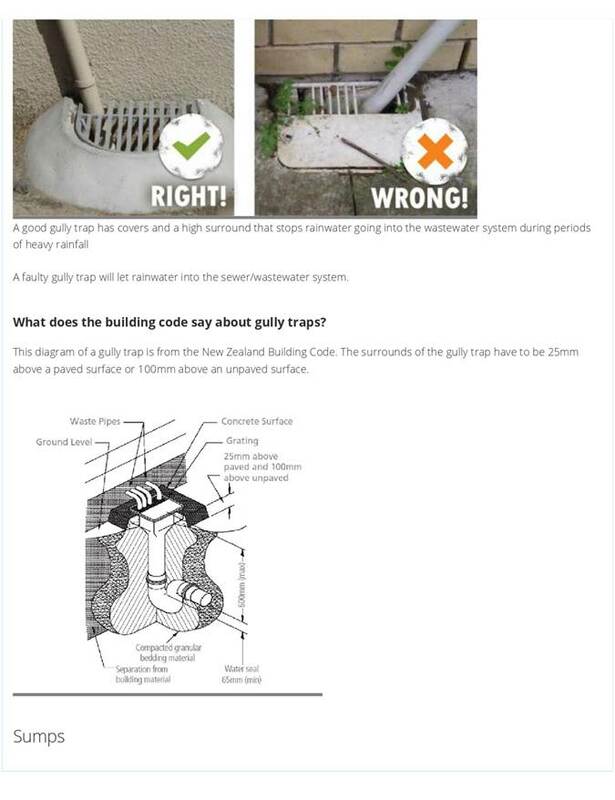 · Gully traps (not including overflow relief gullies) that are at ground level with no barrier to prevent surface water entering the dish. Solutions include installing a new gully trap riser section, fitting a waterproof barrier to the perimeter of the gully trap or renewing the gully trap. The cost of these solutions are expected to be in the range of $100-$500. 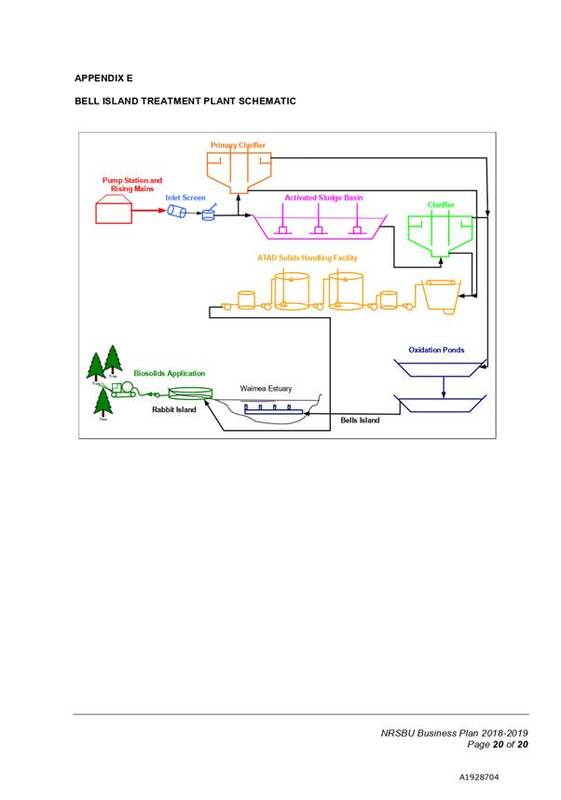 · Stormwater down pipes discharging directly to wastewater gully traps. Solutions depend on the individual property location but can range from diverting downpipe(s) to the stormwater network (if of adequate size) or to adjacent flat land if available on the property, installing a soak pit if possible or installing a rainwater tank. Costs for these solutions will vary between properties and the nature of the solution. The more complex solutions could cost between $5,000 – upwards of $10,000. All of these solutions will need to be installed in accordance with the NZ Building Code and subject to (where necessary) building consent approval. 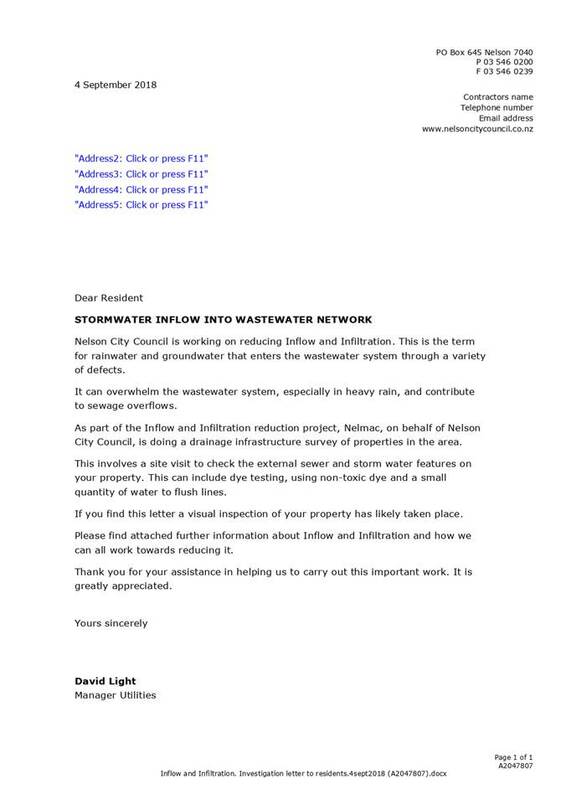 · Stormwater reticulation connected to the wastewater network. Solutions and costs as per the above item. 5.8 Damaged private wastewater pipes. Solutions includes repairing or replacing wastewater pipes. As a large part of the city was developed prior to the 1970’s when modern PVC pipes became common many private laterals were made from earthenware and are reaching the end of their service life. In order to reduce the subsurface infiltration of ground water into the wastewater network Council will need to develop a separate policy to specifically address this area. A report will be brought to a future Works and Infrastructure Committee meeting. 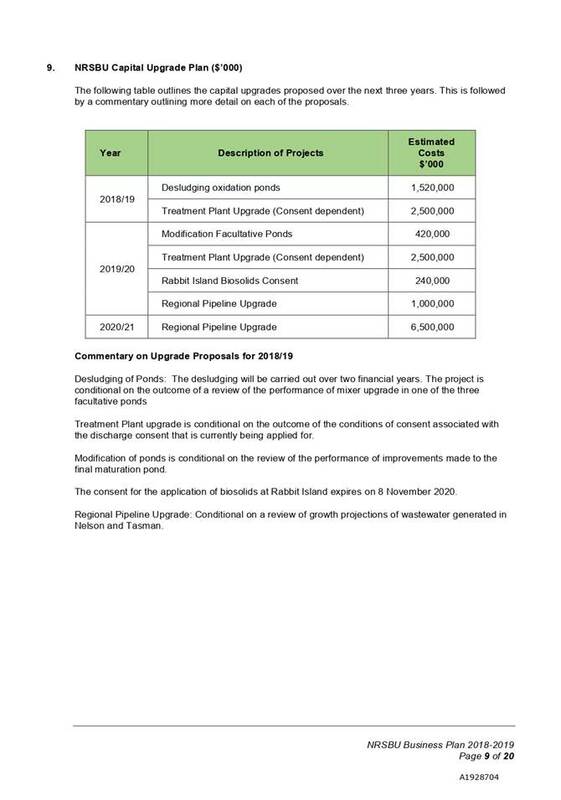 5.9 The LTP 2018-28 has a budget for inflow and infiltration reduction of $250,000 in 2018/19, $290,000 in 2019/20 increasing to $350,000 in 2020/21 and each year thereafter for the remainder of the ten year plan. This budget covers the cost of the contractor’s investigations and any project management and administration costs. A part-time inflow and infiltration co-ordinator is now on board and is working on the project. A part-time community liaison officer adviser will soon be engaged to deal with the public interface. This fully commits the budget and any additional resourcing or funding required would result in the need to increase the budget through the next Annual Plan. 6.1 The Rutherford area trial will allow officers to better and more accurately identify the range of issues, possible remedial options and the quantum of costs for the large more complex fixes. This will in turn guide the discussion with Council as to who undertakes these more complex remedial works and who will cover the costs. A report will be presented to a future Works and Infrastructure Committee in 2019 on the findings and options. 6.2 Addressing wastewater overflows is a key priority for this Council and not doing anything is not an option. This report proposes a targeted communications strategy and addressing “quick-wins” (up to $500) that will ensure Council can reduce inflows from private properties. These are expected to make an impact on this issue. · Option 1 - Commence with the targeted communications strategy and requiring private owners to remedy “quick-wins” (up to $500) at their cost. This will also allow officers the time to gain data on the range of issues, options and associated costs that will guide further discussion with councillors as to who pays for the remedial works where costs will exceed $500. · Option 2 – Not proceed. · Will give effect to one of Council’s top priorities. · Will achieve reduction of inflows. · Push back from private owners. · Will not give effect to one of Council’s top priorities. 7.1 Reducing the number and quantity of wet weather overflows from the wastewater network requires works to both public and private property and is a priority for this Council. 7.2 A targeted communications campaign is proposed that will allow quick wins (up to $500) to be identified and will also allow the collation of data (through a trial) that will form the basis of a further discussion with Council as to who pays for more complex remedial works. 7.3 Officers recommend that the targeted communications campaign commence with urgency and that quick fixes identified (up to $500) be remedied by property owners. Reducing the levels of wastewater overflows from the network ensures Council meets the requirement in the Local Government Act 2002 for good-quality local infrastructure. 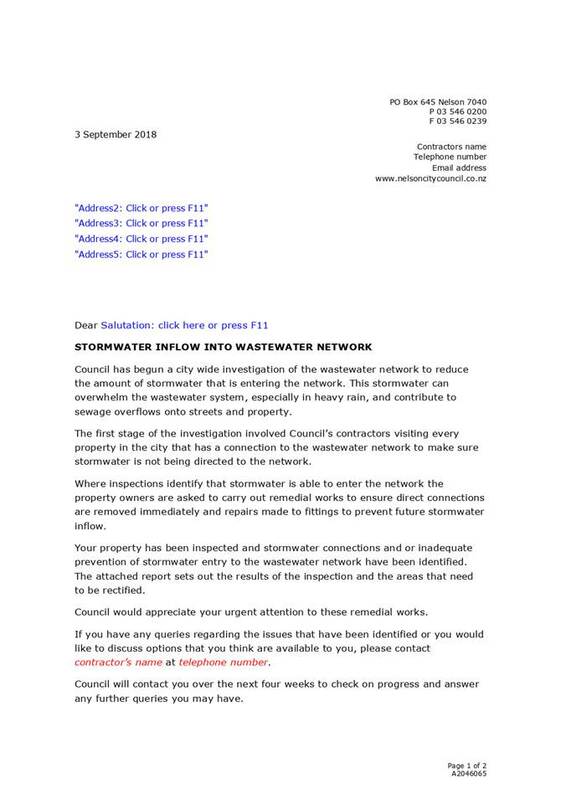 Computer modelling has confirmed a direct link between stormwater being discharged to the wastewater network and overflows from that network during wet weather. Reducing the level of stormwater inflow into the network is considered to lead to a reduction in the levels of wastewater overflows. Option 1 is a mix of voluntary and regulated remedial works that is expected to deliver some of the 40% decrease in stormwater inflow over the next ten years. Requiring property owners to address inflow issues will lead to costs for those owners that will vary with the issue and the location of the property and services. Where costs are affordable property owners are likely to comply with straightforward encouragement. Where costs are higher the level of voluntary compliance is expected to reduce and enforcement may be required. It is possible that the target will not be met if property owners do not carry out the necessary works and wet weather overflows will continue. Failure to reduce wet weather overflows leads to wider adverse public reaction and some impact on the environment. The LTP 2018-28 has a budget for the reduction of inflow and infiltration of $250,000 in 2018/19, $290,000 in 2019/20 increasing to $350,000 in 2020/21 and for each subsequent year out to 2027/28. This budget has to fund contractor investigations and project management costs. Once an additional advisory/enforcement role is resourced in 2018/19 the budget will be fully committed. Any additional resource and funding required will result in the need to increase the budget through the next Annual Plan. The proposed recommendation leads to a matter of low/medium significance for most people because the likely costs of remedial works is likely to be around $500/affected property. For some properties the proposed recommendation will be of high significance because the likely costs of remedial works will be greater than $500. Therefore public engagement will occur in the form of education material in Our Nelson and the Council website. An additional advisor resource to help with property owner enquiries is also proposed. 1.1 To approve allocation of additional funds to enable the award of a construction contract for the replacement of the existing bridge across Saltwater Creek and allow commencement of work in the 2018/19 financial year. 2.1 The existing Saltwater Creek Bridge is a basic 1.1m wide structure that caters for traffic in one direction at a time. It is a bottleneck between two sections of wide cycle/walkway either side of the bridge. There are safety concerns with the existing structure relating to the narrowness of the bridge that has the potential to cause conflict between walkers and cyclists. 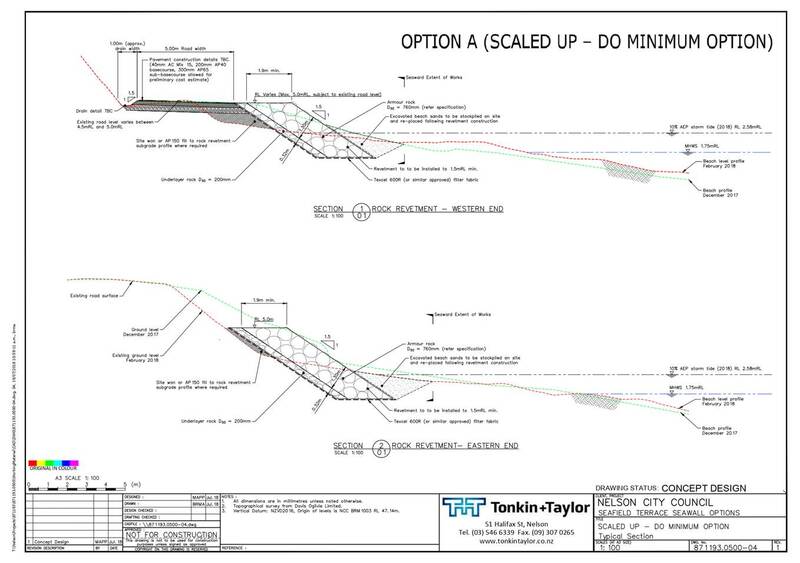 There are also issues with very steep exit/entry grades onto the bridge. A weight restriction has been placed on the bridge limiting its capacity to ten people at any one time. 2.2 Additional funding of $300,000 is required to award a tender to allow construction work to commence and to maximise the UCF funding. A decision is needed as to whether to allocate this additional funding and proceed with the project. 4.1 The project was originally tendered in late 2017 and tenders came in over budget and no tender was awarded. The project was re-tendered in 2018 and three conforming tenders were received. 4.2 The project attracts Urban Cycle Funding (UCF) of $500,000 which is required to be spent by June 2019. 4.3.1 The Haven Road (Maitai to Rocks Road) shared path replacement. This is been managed by NZTA, attracted $2M UCF funding and will officially open on 30 September this year. 4.3.2 Saltwater Creek Bridge - $500,000 UCF funding – the subject of this report. 4.3.3 Tahunanui Cycle network – $500,000 UCF funding. The preferred route has been approved by this committee and detailed design has commenced. It is expected that work on the State Highway section will commence in 2018/19 with the council section proceeding the year after. 4.4 The current bridge is narrow (1.1m wide) and restricts access. The replacement bridge (refer to Attachment 1) will complete the link between the recently completed Maitai walkway and the Haven Road shared path about to be opened. 4.5 The new bridge is to be located slightly upstream of the existing bridge to cater for future modelled flood events and to allow path gradients down to the underpass to be eased. The new bridge design has strong architectural elements designed to match visual aspects of the Maitai River Walkway and Trafalgar Centre and will provide an appealing entry to the City. 4.6 It is expected that walking and cycling participation will increase on this high quality off-road link between the CBD and the Nelson waterfront. 5.1 The construction contract has been tendered twice, the latest in 2018. The most recent tenders are in excess of the current budget and additional funding will be required to enable a tender to be awarded and for construction work to commence. 5.2 Prices from three reputable tenders have been received and a detailed tender evaluation has been undertaken by Stantec with a peer review by Tonkin and Taylor. 5.3 If the project does not proceed at this time, the UCF funding will be lost, and there will be a risk that suppliers will not tender a third time. 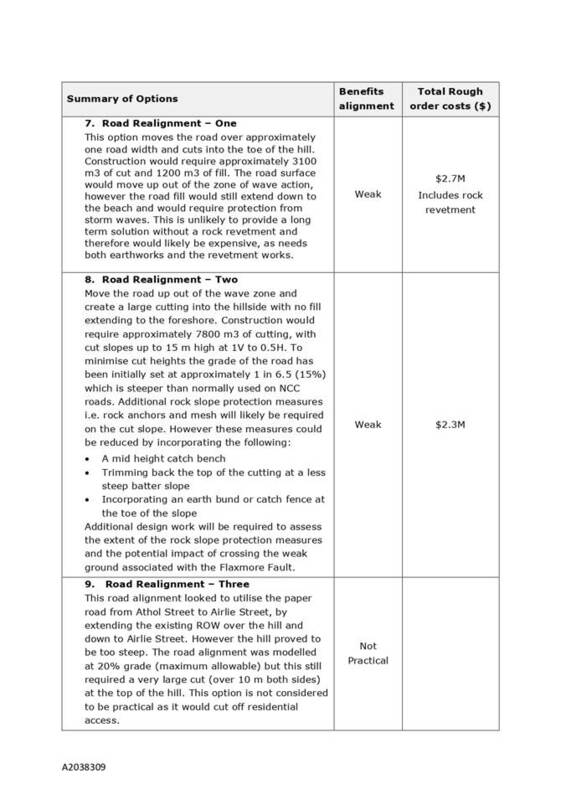 6.1 The budget for the project (including the proposed carry-over of $502,000 from 2017/18) is $902,000. 6.2 The preferred tenderers price is $810,000 and the Engineer’s estimate (Stantec) is $680,000. The three prices received were for $810,000, $1.4M and $1.5M. 6.3 The tender evaluation was undertaken using NZTA’s price quality evaluation and was undertaken by an NZTA accredited evaluator. The evaluation included calling references, a credit check, a check of the directors, a google search and a check against any court judgements. The credit check has been independently reviewed by Council’s Finance department. 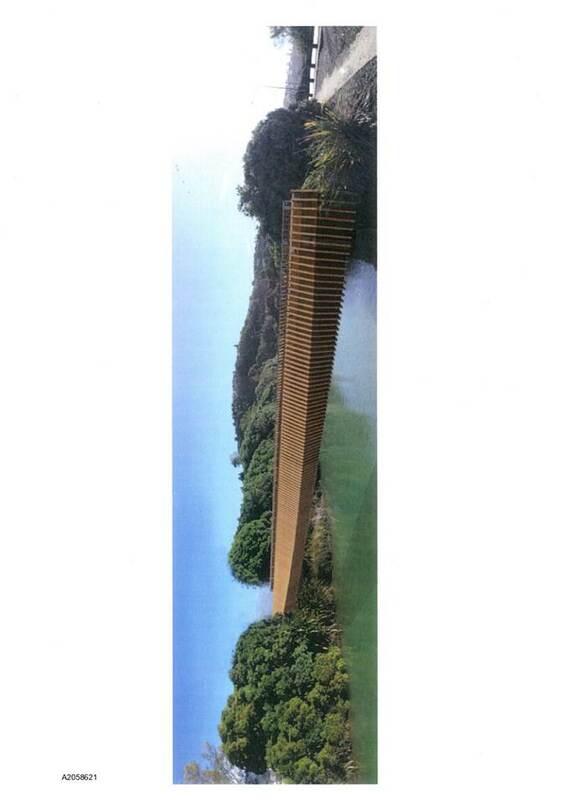 6.4 The preferred tenderer is Levin based and is a specialised bridge contractor that has done extensive work in the region (specifically in Tasman – notably the 80m long swing bridges across the Wairoa River as part of the Great Taste Trail). The Tasman District Council were complementary on Edifice’s standard of work. 6.6 A 30% contingency has been included to cater for any potential geotechnical risk that may result from the piling and working adjacent to the State Highway. 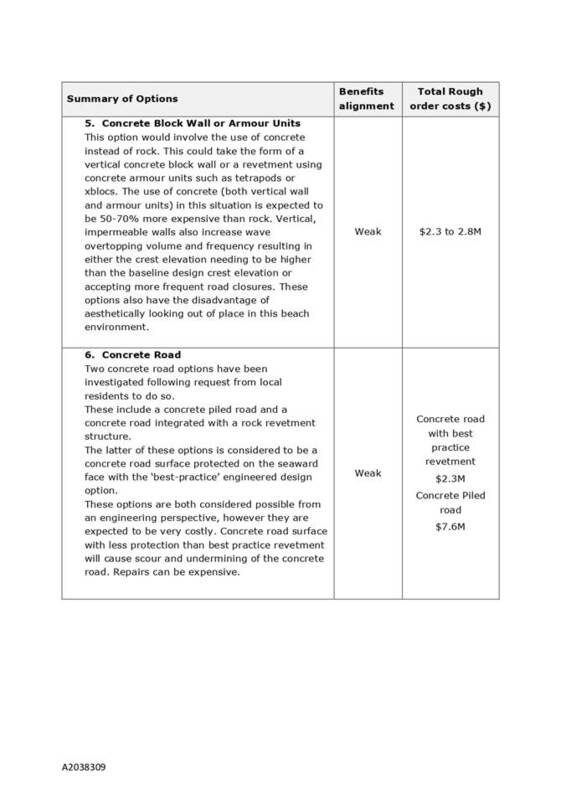 6.7 The additional cost does not attract any further UCF/NZTA funding. 6.8 The bridge is one component of the project and accounts for around 30% of the actual scope and cost of the project. 7.1 There are two options to consider – Proceed or Not Proceed. In order to make use of the UCF funding subsidy, option 1 “Proceed”, with a 30% contingency is recommended. · Delivery of a high quality link between the CBD and waterfront for active travel modes. · Significant reduction in safety concerns regarding aspects of the current bridge and paths. · Aesthetically pleasing infrastructure in a gateway site which ties into the Maitai walkway. · Secures the UCF funding. · Will increase service levels at subsidised cost, in a location where this will be required at some point in the near future. · Significant construction spend as planned. · Perception that the project cost does not represent value-for-money. 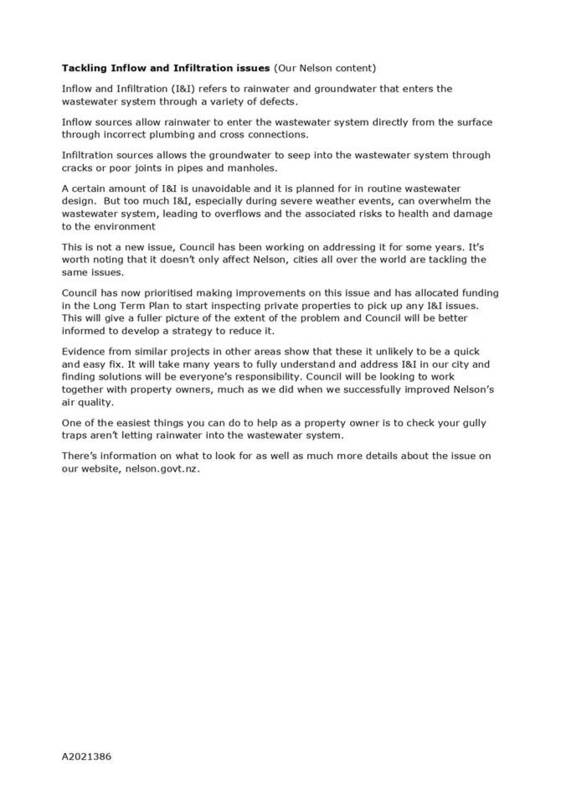 · Potentially negative media regarding not following through to construction. · Risk that work will be required later at greater cost and increased Council cost, with no UCF subsidy. · Tenders may not wish to tender a third time if the project is resurrected again. 8.1 The project has been underway for two years and significant money has been spent on the project to date. 8.2 The UCF fund has been extended specifically for this project to cater for construction in 2018/19 and will be lost if the project is put on hold. The subsidy from the UCF towards the construction represents good value to Council and the ratepayers. 8.3 Significant high quality infrastructure has been put in place on either side of the current bridge, with the result that the bridge is now the last link to complete the upgrade. In addition, there are safety and capacity concerns which need to be addressed. 8.4 Once constructed, the new bridge will form an impressive entry to the CBD path network, address safety and capacity issues, and provide a consistent high quality route for active travel modes. This project will link with existing shared path infrastructure and promote active transport participation rates and will provide good quality infrastructure. “Our infrastructure is efficient, cost effective and meets current and future needs”; “Our communities are healthy, safe, inclusive and resilient”; “Our Council provides leadership and fosters partnerships, a regional perspective, and community engagement”. A detailed evaluation has been undertaken by Stantec engineering consultants and with the 30% contingency should allow for any potential unforeseen ground conditions that may be encountered on site. The project qualifies for UCF fund up to end of June 2019. The increased tender prices will however need additional council funding. This matter is of low overall significance. However, it is a very visible high profile site and the bridge will be a significant piece of infrastructure from an aesthetic perspective. The design has also been consulted on with Friends of the Maitai, Nelson Civic Trust, Bicycle Nelson Bays and Nelson Walkers United. Maori have not been consulted on with respect to this report but a Cultural Impact Assessment has been carried out during the design process. · Any other matters within the areas of responsibility noted above. Unbudgeted expenditure is a Council decision. 1.1 To agree on an approach to remediate Seafield Terrace. 2.1 Seafield Terrace was damaged during a storm event in November 2017 and a cyclone in February 2018. These events resulted in closure of the road, cutting off access for 32 households in Airlie Street (to which there is no alternative access road) and damaging utilities and other services located under and near Seafield Terrace. 2.2 Coastal risks to this road are expected to intensify in future due to climate change. The main impact will be sea level rise but there is also potential for an increased frequency and intensity of storm events. 2.3 Services damaged during the events have been temporarily relocated and reinstated. Road access has also temporarily been reinstated pending a final remediation option. 2.4 NIWA have been appointed to assess the nature of the events, likelihood of recurrence and to undertake coastal modelling with Tonkin & Taylor (T&T) appointed to assess a range of remediation solutions. Remediation costs range from between $408,000 and $8M. Of ten options considered, two options have been considered as possible solutions. 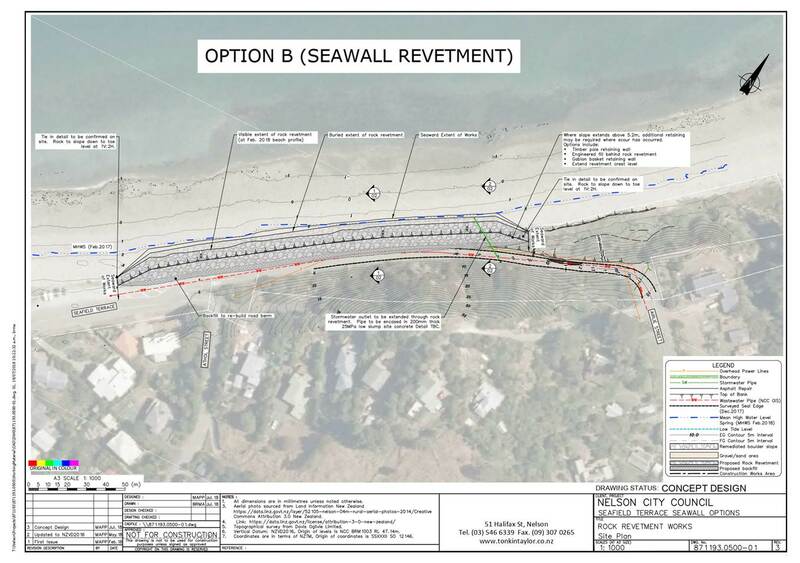 2.5 Deciding to remediate the road with rock protection now risks being out of step with the coastal hazard planning to be carried out as part of the development of the Nelson Plan, following the process recommended by Ministry for the Environment (MfE). 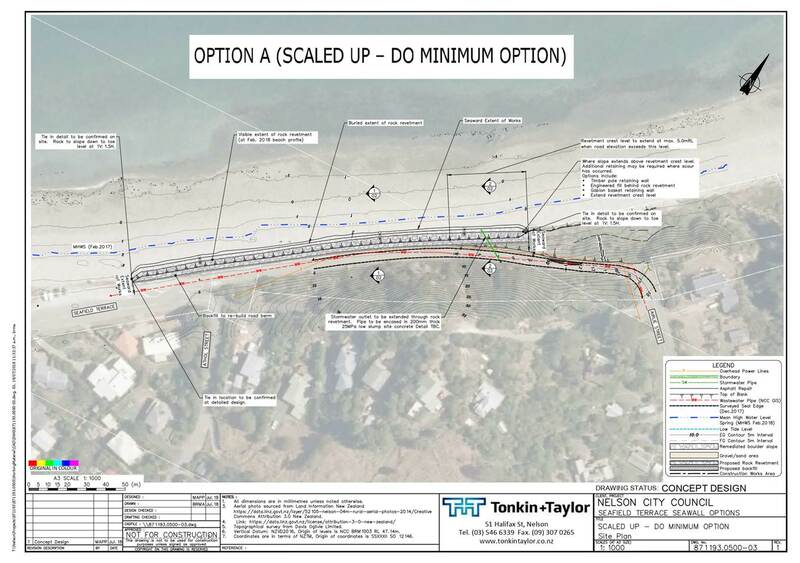 This risk needs to be weighed up alongside the risk of not having a functioning road for the 32 households in Airlie Street, particularly in the case of an emergency requiring fire or police access, as well as delaying the opportunity to enhance this road for cyclists and pedestrians accessing the Cable Bay Walkway, the Horoirangi Marine Reserve, the beach and the Boulder Bank. 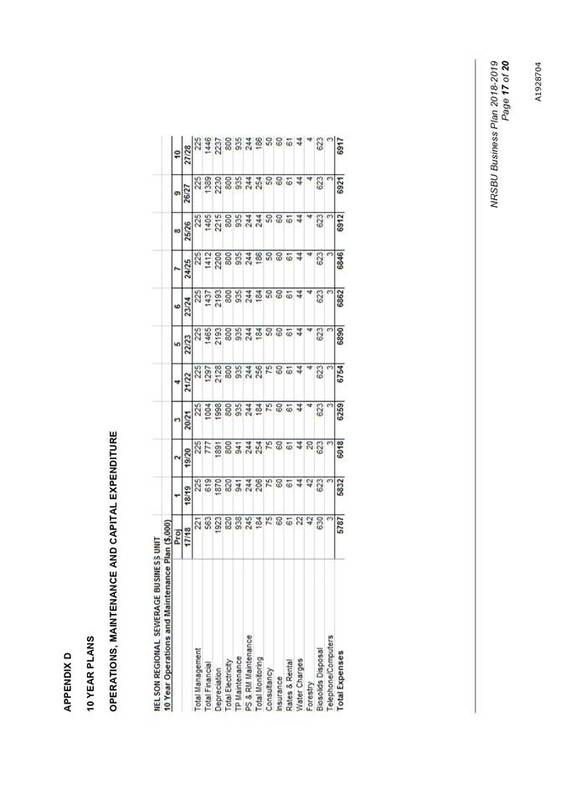 2.6 This report is to be read in conjunction with report R9709 in the public excluded section of the agenda. Receives the report Seafield Terrace remediation (R9621) and its attachments (A2040890, A2038309 and A2041411). 4.1 There was a large north-westerly storm event in November 2017 and cyclone in February 2018. The November event resulted in some minor erosion along the edge of Seafield Terrace, however the February event caused major erosion. The location of the affected area is shown in Attachment 1. 4.2 The February storm (ex-cyclone Fehi) was an event with a joint probability of occurring once in 303 years. It resulted from a combination of a king tide (with the worst effects occurring two hours either side of high tide), the low pressure system created by the cyclone lifting the sea level, and strong north westerly winds generating waves on top of the sea surge from the Tasman sea. This combination of effects eroded the road berm and approximately one metre of the road carriageway width over a 200m length. The remaining carriageway width was impassable due to damage and debris. 4.3 The road which is between 4m and 5m wide has been temporarily reinstated to provide a gravel surface three metres wide, single lane access for Airlie Street residents. There is currently no protection of the seaward edge. 4.4 Underground sewer pipes and telephone cables and overhead electricity poles were also damaged by the storms and have since been relocated inland of the temporary road. 4.5 Meetings were held with the residents on 21 April and 17 June. At the 17 June meeting residents noted they are willing to accept that access to Airlie Street will be closed on occasions, but are seeking a more permanent solution to their access. 4.6 Separate engagement with Airlie Street residents has commenced relating to a stormwater upgrade. That project has no direct bearing on the Seafield Terrace remediation. 4.7 The average daily traffic measured in 2015 was 443 vehicles per day. In addition pedestrians accessing the Cable Bay walkway need to walk along Seafield Terrace and Airlie Street as there is no parking at the beginning of the walkway. Pedestrian demand is also driven by visitors and locals accessing the beach, Boulder Bank and Marine Reserve. 4.8 There are no footpaths along Seafield Terrace. Actual speeds have not been measured but residents have raised concerns about excessive speeds. The speed environment should be managed below 30km/h because of the high volume of pedestrians present. A width of between 4 and 5m exists and any detailed design could consider either a 5m road (no footpath) or a 3m road with a 2m shared path. 5.1 The most recent MfE guidance (Coastal Hazards and Climate Change — Guidance for Local Government) released in December 2017 states that in the near term (by 2050) a 0.2–0.4m of sea level rise is most likely. Sea-level rises of up to one metre are ‘very likely’ in the next 100–130 years. 5.2 T&T used the MfE’s December 2017 guidelines to develop the best practice design, and assessed the difference in expected overtopping between the roads at current elevation, and raising the road by 0.5m and by 1.0m. These calculations show that not raising the road elevation will result in more frequent road closures for pedestrian and driver safety in the next 50 years. 5.3 As part of the Nelson Plan process the Council will begin to engage with the community on coastal hazards in November 2018. This process is likely to follow the Dynamic Adaptive Policy Pathways Approach (DAPP) recommended in the MfE’s December 2017 guidelines for decision making about coastal hazards. This process centres on community engagement, risk/vulnerability assessments and identification and evaluation of a wide range of different options (structural and non-structural) and use of a possible combination of them over time (pathways). 5.4 Including Seafield Terrace remediation options in the planned community-wide process would ensure a fair and consistent approach across Nelson. However, this would mean that a decision is unlikely to be reached for at least several years as the engagement process that informs the Nelson Plan is expected to be prolonged. This needs to be added to the six months to two years required to gain approval for NZTA funding, to complete the design, apply for resource consent and carry out the necessary construction. 5.5 It is also important to note that the safety risks associated with Seafield Terrace are higher due to the much deeper water and exposure to surge waves from the Tasman Sea, as well as waves generated by north-westerly winds, than for sheltered estuary environments such as Monaco. This greater risk will need to be factored into the consideration of options over the short, medium and long term. 5.6 Risks are also greater than for many other areas in Nelson because Seafield Terrace is the only road access to 32 households in Airlie Street, including emergency services (especially fire response vehicles). 5.8 There are opportunities as well as risks associated with remediation of Seafield Terrace. · Slow vehicle speeds down on Seafield Terrace (addressing a longstanding concern on Airlie Street residents). This could be achieved by either creating a 2m wide shared path for cyclists and pedestrians and a one lane 3m wide road; or by introducing traffic calming infrastructure within the road environment. · Protecting Seafield Terrace from coastal hazards could lead to more urban development in an area which is reliant on this route, increasing the number of vulnerable households in this area over the long term. · A storm event greater than the design storm could occur during or immediately after constructing a revetment (sea wall) that severely damages it. Likelihood of storm events is covered in section 6 of this report. · A solution which involves a 5m wide road and no footpath could encourage high vehicle speeds which will increase safety risks for pedestrians and cyclists. The original road width was between 4 and 5m. 5.11 No specific budget has so far been allocated for Seafield Terrace remediation work. However, preliminary discussions with the New Zealand Transport Agency (NZTA) suggest it is likely that an application for a 51% funding contribution in the minor works category (< $1M) would be successful. 5.12 If the Council chooses an option which is >$1M the proposal would need to be included in the Regional Land Transport Plan (RLTP), considered in terms of its relative priority compared to other projects in the RLTP. 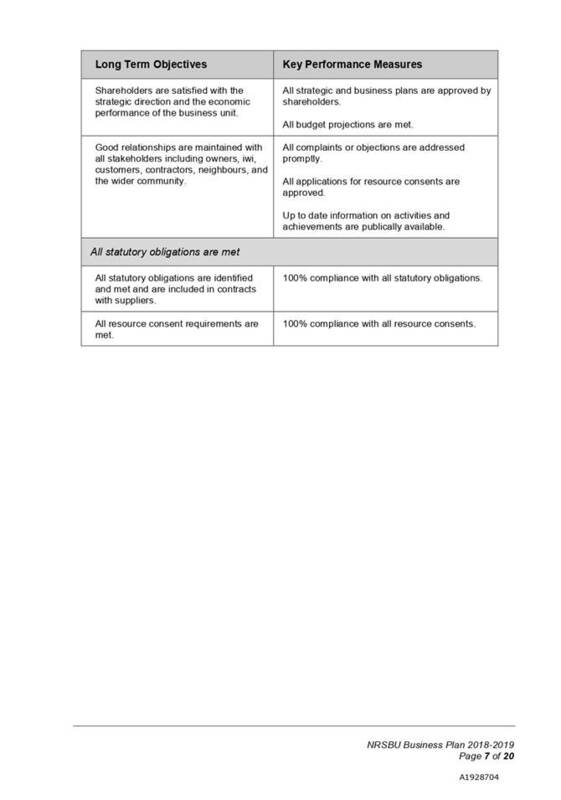 The business case would be assessed by NZTA using the criteria in the Investment Assessment Framework. 5.13 The Mayor, Works and Infrastructure Committee Chair and senior management have been liaising with local residents regarding storm damage repair and future protection. Local residents’ ideas for future proofing road access to Airlie Street have been considered in full in the T&T report. 5.14 A 6–24 month implementation programme is anticipated depending on the chosen option because of the sensitive nature of the area and the consultation required to gain resource consent. 6.1 Ten options were considered in the T&T report, including a number of suggestions from residents. 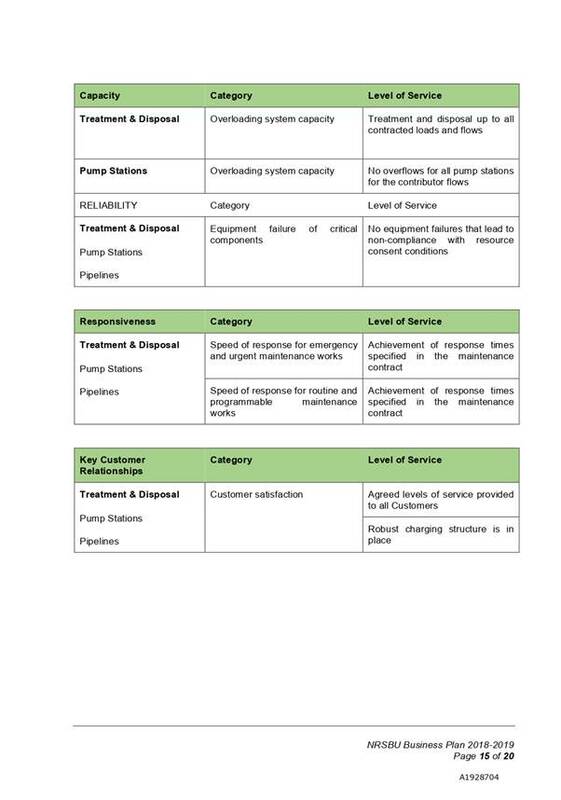 These and their relative costs (including 30% contingency) are summarised in a table in Attachment 2. The table shows that costs for some of the options are very high (and have been discounted) and some are not practical. 6.2 To do nothing in terms of remediation is not deemed practicable as continued high tides and strong wave action will continue to erode and undermine the road putting both council assets and private utility operators’ assets at risk and will result in repeated road closures for maintenance and/or repair. 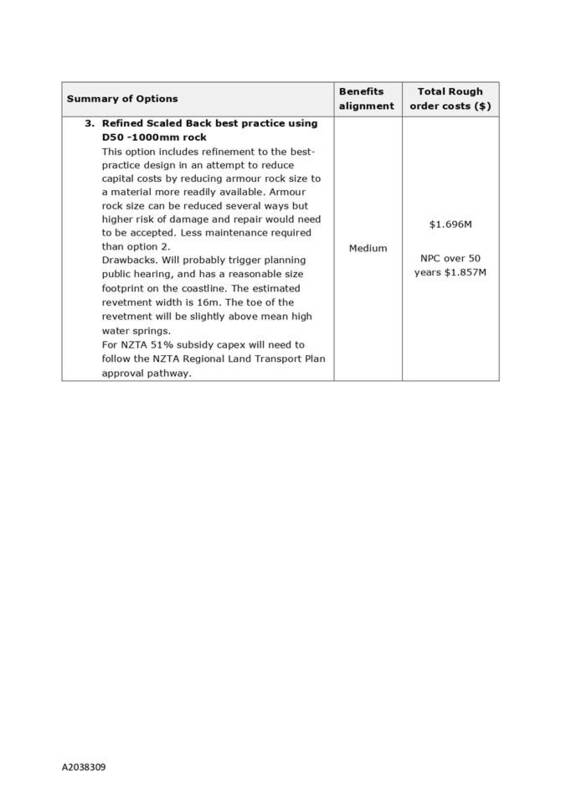 6.3 Doing the minimum as outlined in the T&T report, even though considered an option, is not considered practicable because the road would remain susceptible to future inundation and erosion hazards and will only offer minor road protection with the small sized rock revetment protection. Large scale repairs are still expected after moderate storm events. This option has not been considered further. 6.4 Two options are deemed feasible (referred to as Option 2 and Option 4 in Attachment 3) and have been considered as viable options as detailed below. 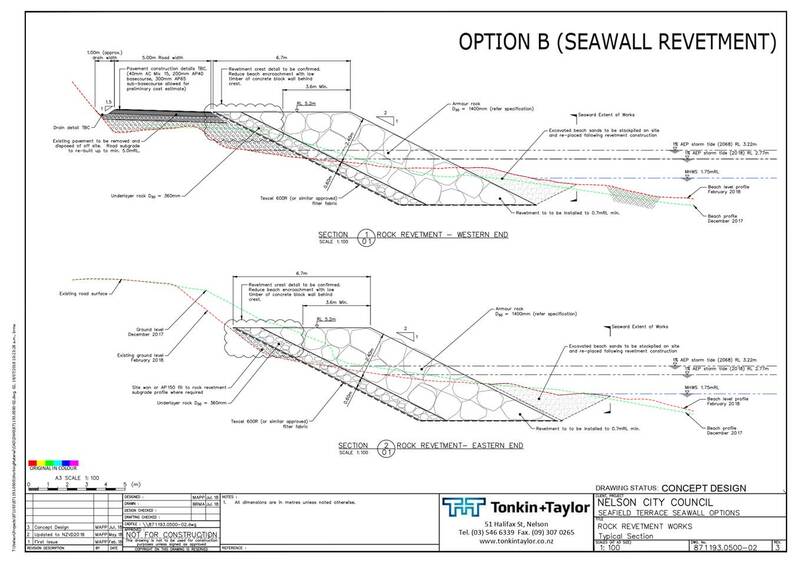 Both options are expected to have only minimal effect at the extremities of any proposed revetment structures, however these will be addressed in greater detail in the consent application. · Option B: Best practice design which allows for raising the road by on average 0.75m, with rock revetment. The raised height of the road will decrease frequency of road closure and damage to the road surface. Preliminary Net Present Cost (NPC) over a 50 year period are shown in the table below, with details for each option expanded on below. 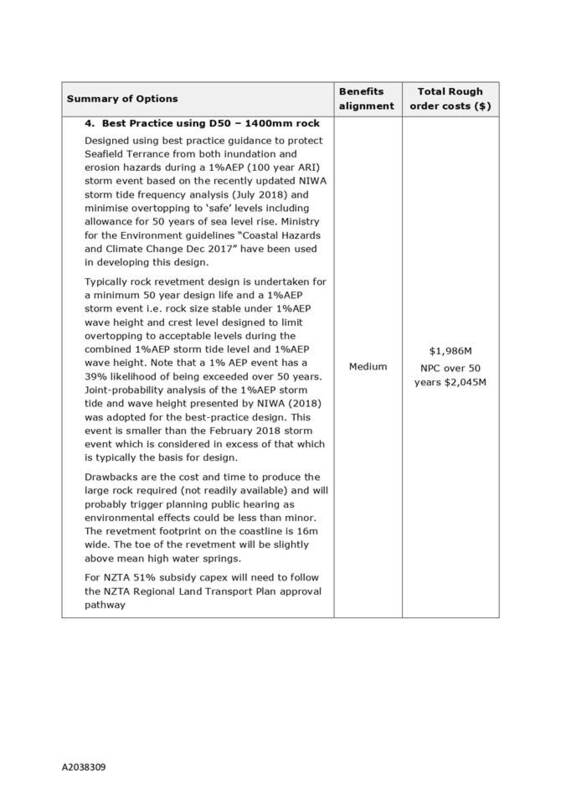 6.5 This option consists of a six metre wide rock revetment structure similar to the ‘best practice’ engineering design that aims to protect the road from a 5–10 year Annual Return Interval (ARI) storm event. The reduced scale of this option means readily available rock sizes can be used, and it reduces upfront capital costs while still providing a level of future protection for the road and services. 6.6 This design would be safe to pedestrians in a 5–10 year ARI storm event. However, overtopping calculations indicate an average of 140 litres per second per lineal metre (l/s/m) of overtopping would occur during a 100 year ARI storm which would be dangerous to pedestrians and is likely to cause damage to the road. This means the road is likely to require closure during storm events greater than a 5–10 year ARI storm, and maintenance to the revetment and repairs to the road may be required following these events. Large scale damage can be expected in large storm events (with a 100 year ARI). 6.7 The scaled-up do-minimum option is the most practical and cost-effective option for Council to adopt in the short to medium-term. It provides some flexibility to change the approach over the longer term, depending on the outcome of the coastal hazards and climate change planning work. 6.8 This option consists of a 16 metre wide structure using large rocks, and raising the existing road level approximately 0.75m. 6.9 The figures above assume sufficient prioritisation in the Regional Land Transport Plan and sufficient alignment with the Investment Assessment Framework to receive a 51% subsidy from NZTA. 6.10 This rock revetment is designed to protect Seafield Terrace from both inundation and erosion hazards during a 100 year ARI storm event. It would also minimise overtopping to ‘safe levels’ even when allowing for 50 years of sea level rise. · This option would use readily available rock sizes (reducing long lead in times) and reduce upfront capital costs upfront, while still providing a level of future protection for the road and services. · Road closures to repair damage would be less than the status quo option (these could be expected to be required once every three to five years). · Protection lowers risk of Airlie Street residents being cut off from emergency services. · Smaller footprint than the best practice option (6m rather than 16m wide) therefore less visually intrusive, less risk of interference with coastal processes, and potential for a more straightforward resource consent application process. · The capital required fits within the NZTA Low Cost/Low Risk works category, which would not require amendments to the Regional Land Transport Plan or the more complex NZTA approval pathway required for larger projects through the Investment Assessment Framework. · Potential alignment issues related to the community engagement on coastal hazards beginning in November 2018. However, this approach does focus on a short to medium solution, so is a better fit with the recommended adaptive planning approach than the best practice option. · Ongoing maintenance and road closures are likely to be required during storms with greater than a 10 year return period to avoid safety risks for pedestrians and drivers. · Not easily upgraded to Option B in the future as rock sizes are different for the two options. · This option would minimise road closures during storm events, and for road repair/maintenance works. · Seafield Terrace would be able to withstand a 1:100 year storm event with minor repair maintenance. · Road closures to repair damage could be expected to be required only once every 20 years. · This approach does not align well with the community engagement on coastal hazards beginning in November 2018, as it predetermines the approach to be taken in this area. · Quarries in the area will need to specially cut the large rocks which will take several months. · This is the most expensive option, even when reduced maintenance costs are taken into account. · More complex approval pathway to gain NZTA 51% subsidy. · Complex resource consent process for a 16m wide structure. · Maintenance of the road in storm events > 1:100 will still be required. 7.1 Funding is unbudgeted and NZTA approval is required for funding assistance. 7.2 The estimate (with a 30% contingency) for Option A is just below the threshold of $1Million for NZTA’s Low Cost/Low Risk category. If tenders come in higher than this estimate then discussions with NZTA as to funding and/or inclusion in the RLTP will need to be had. 8.1 Option A: Detailed design 2018/19; Resource consents, procurement, construction 2019/20. 8.2 Option B: Detailed design 2018/19; Resource consents and procurement, 2019/20; Construction 2020/21. 9.1 The storm events from November 2017 and February 2018 caused considerable damage to Seafield Terrace and associated infrastructure services, and there is a risk that Airlie Street residents will be cut off (including from emergency services) during and after another significant storm. The risk to the road from minor events remains high in its current state. 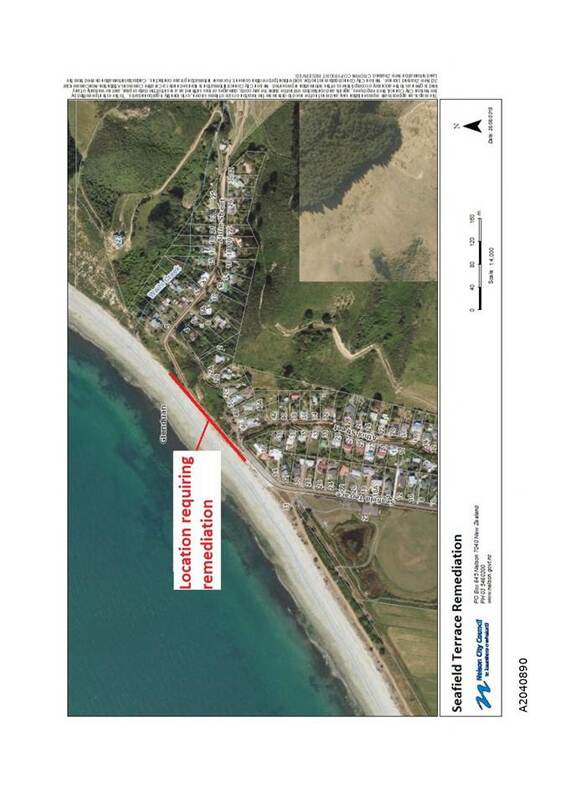 9.2 A decision is required on whether or not to progress remediation of Seafield Terrace now, or to delay this project in order to align with the completion of the Nelson-wide coastal hazards and climate change consultation and planning processes, as part of development of the Nelson Plan. 9.3 Due to the risks of delaying this project for several years, officers recommend the ‘scaled up do minimum’ approach to remediation of Seafield Terrace. This report considers how best to meet the current and future needs of the community for good-quality local infrastructure in a way that is most cost-effective for households and businesses. It considers what level of protection is appropriate to both present and anticipated future circumstances, particularly with regard to sea level rise. Our infrastructure is efficient, cost effective and meets current and future needs — Nelson relies on its good quality, sustainable, affordable and resilient infrastructure network - This report considers how to improve the resilience of the transport network, particularly for 32 households whose only road access is via Seafield Terrace. Our communities are healthy, safe, inclusive and resilient — our community works in partnership to understand, prepare for and respond to the impacts of natural hazards - The safety of residents, as well as cyclists and pedestrians, are key factors to be considered when weighing up the options for remediation of Seafield Terrace. Our Council provides leadership and fosters partnerships, a regional perspective, and community engagement — Council leaders are mindful of the full range of community views and of the generations that follow - This report considers the effects of sea level rise over time, and how to align as much as practicable with the upcoming community engagement regarding coastal hazards and climate change. The proposed approach addresses both immediate risks (related to road safety and access to emergency services) and retains enough flexibility for Council to take a different approach in future, as sea levels rise. The risk of precedent being set for other coastal locations if Council choses a remedial option for Seafield Terrace is deemed to be low as there are special circumstances with respect to Seafield Terrace, namely the need to provide access (including emergency access) to a fixed number of properties that have no alternative access. All options incur a cost to Council and this is unbudgeted. The option chosen will dictate the cost to Council. This matter is of medium significance because of its high importance to a relatively small part of the community. The Mayor, Committee chair and senior management have been liaising with local residents regarding storm damage repair and future protection. 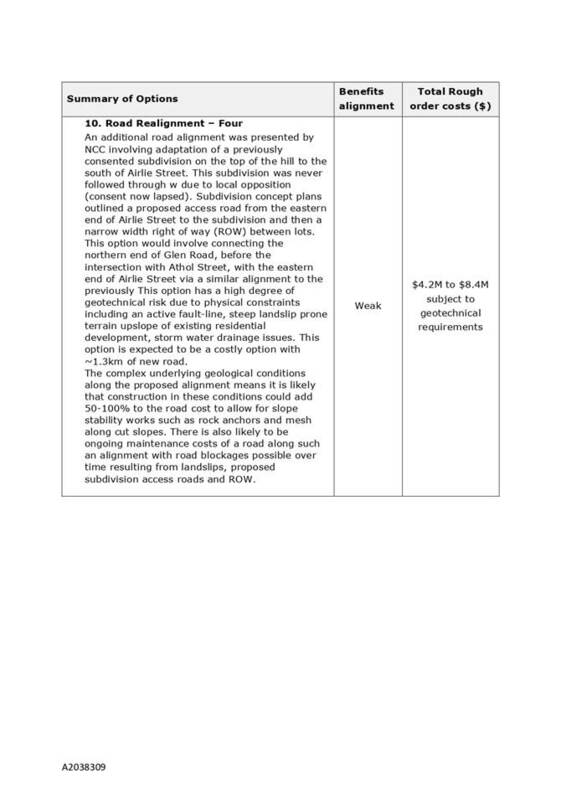 Local residents’ ideas for future proofing road access to Airlie Street were considered in full in the T&T report. Further, formal consultation with all stakeholders will be carried out as part of the resource consent application process. Stakeholders include iwi, Department of Conservation, NZTA, Airlie Street residents and the wider community. - there is a heritage site terrace (MS47: Kainga (Tototari) where the Boulder Bank meets hills at the Glen nearby (approximately located at 34 Seafield Terrace). 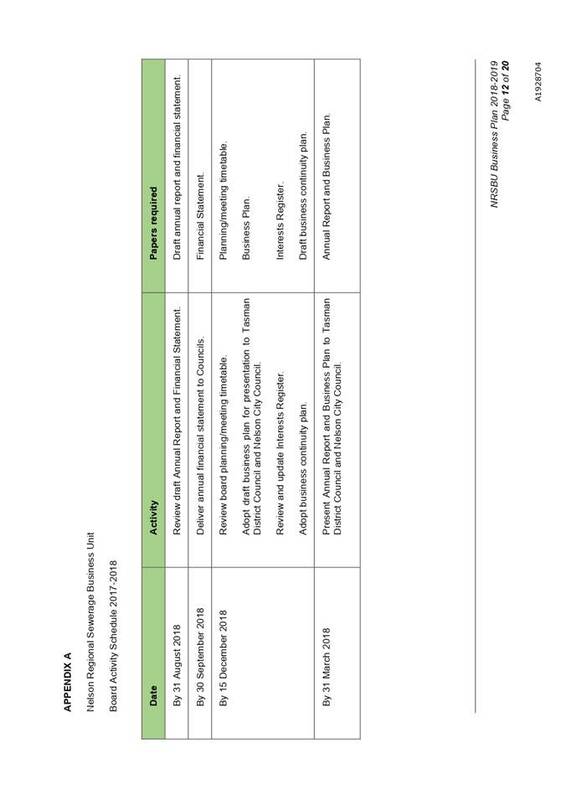 The Infrastructure Committee has the following delegations to consider Seafield Terrace remedial works. · Roading network, including associated structures, bridges and retaining walls, walkways, footpaths and road reserve, landscaping and ancillary services and facilities, street lighting and traffic management control.